A good day for the end of the season. 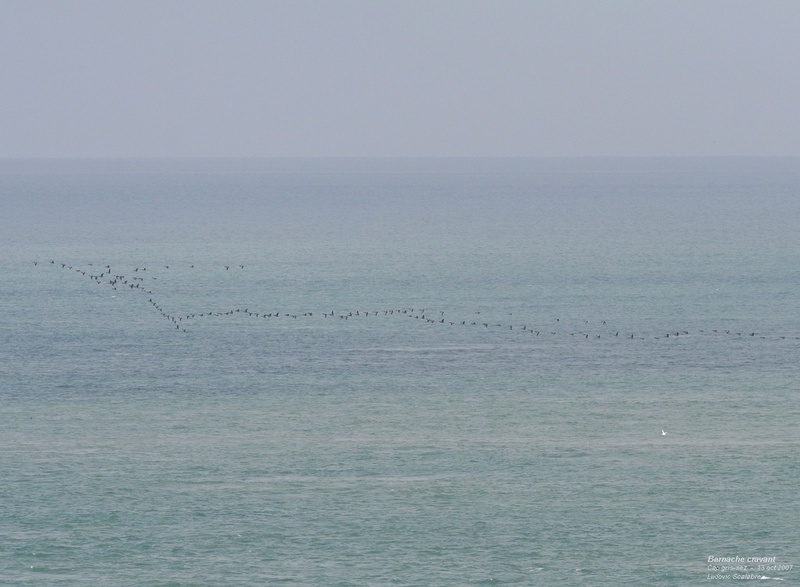 Good migration for divers with 73 Red-throated Divers (poor numbers for the moment) and 134 Black-throated Divers. Few Fulmars with 6 ind. 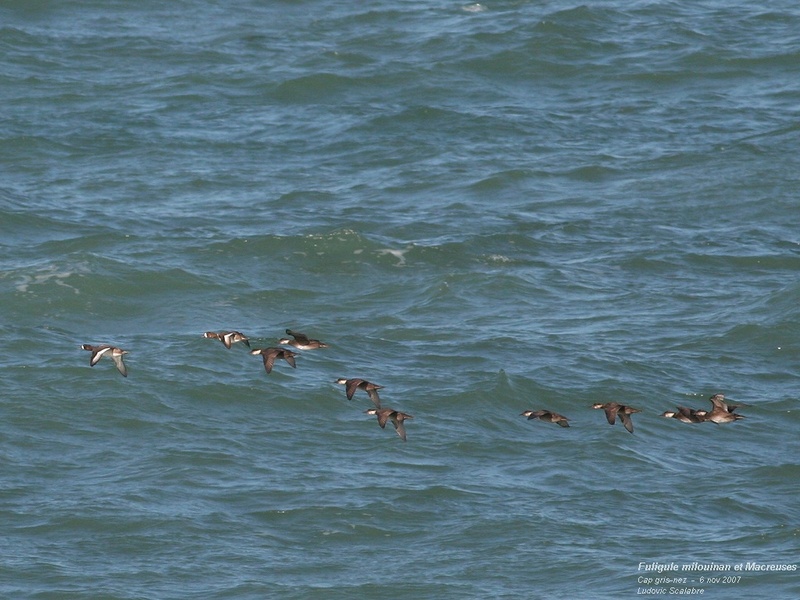 Some shearwaters with 13 Sooty Shearwaters (end of migration). Good numbers for Gannets (1 892 ind.). Few ducks and waders... Again good numbers for skuas with 22 Pomarines Skuas, 2 Arctic Skuas and 12 Great Skuas. Good numbers for gulls with 57 Little Gulls, 1 Pontic Gull (local) and 4 623 Kittiwakes. 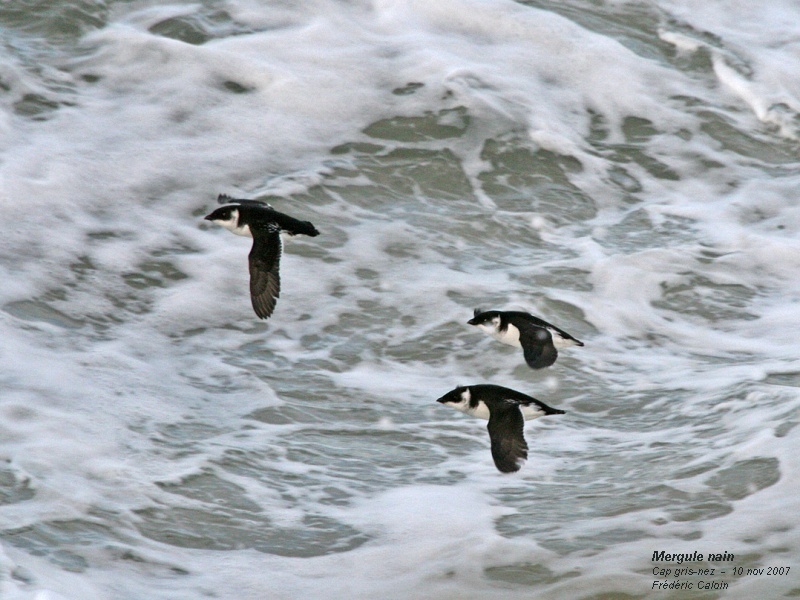 Medium numbers for auks with 400+ individus. 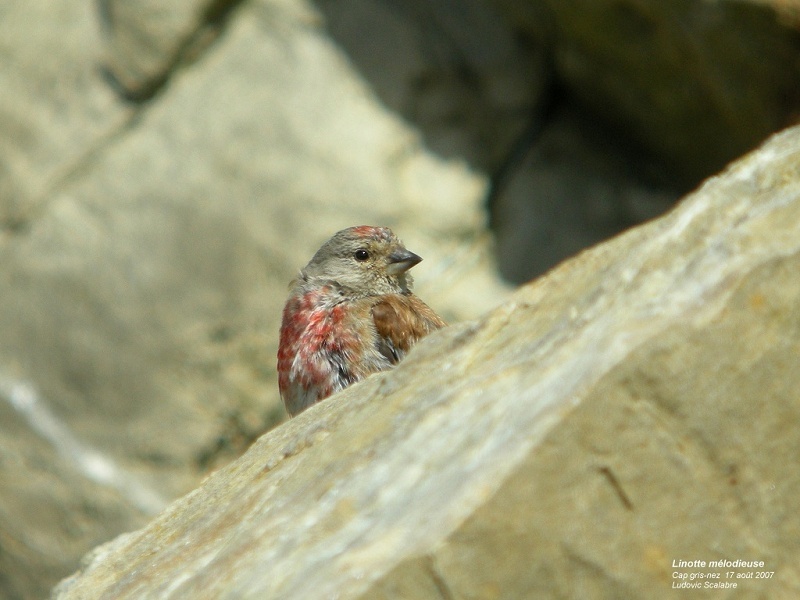 Peu d'oiseaux mais encore quelques bonnes données pour une journée peu venteuse. Le coup de vent de N de la veille a peut-être joué un rôle sur le passage du jour. Peu de plongeons avec 105 Plongeons catmarins et 2 Plongeons arctiques. Quelques grèbes sont notés dont 1 Grèbe jougris, ainsi que 2 Cormorans huppés (hivernage ou migration). Quelques anatidés mais toujours pas de nombres importants (période favorable) avec 5 Oies cendrées, 94 Bernaches cravant (fin du passage), 20 Tadornes de Belon, 1 Sarcelle d'hiver, 1 Canard pilet, 2 Fuligules milouinans, 6 Eiders à duvet, 64 Macreuses noires, 5 Macreuses brunes, 1 Garrot à oeil d'or et 15 Harles huppés. Encore quelques labbes sont notés, 2 Labbes pomarins (il est probable qu'il reste quelques individus tout l'hiver) et 2 Grands Labbes. Peu de laridés et d'alcidés mais 2 Mergules nains sont encore observés en vol nord. An other incredible day !!!! 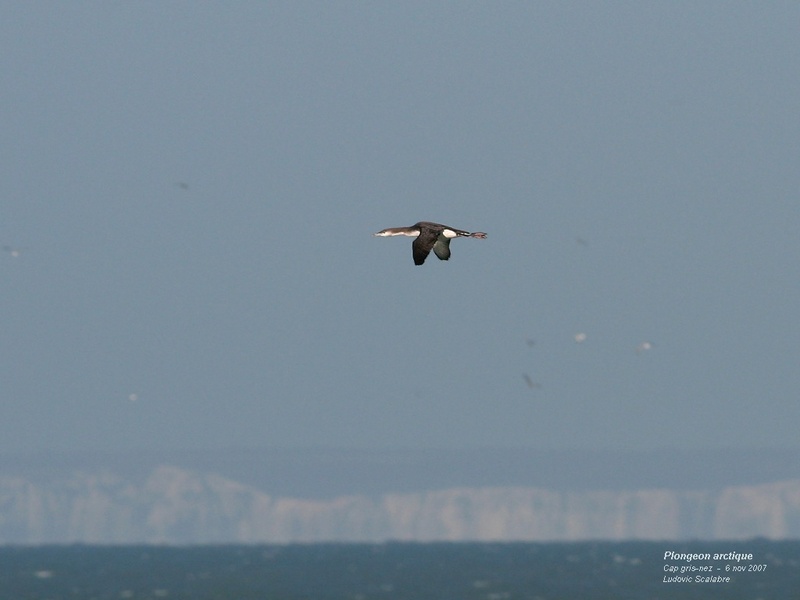 1st mention of the White-billed Diver seen previously at le clipon and Calais. 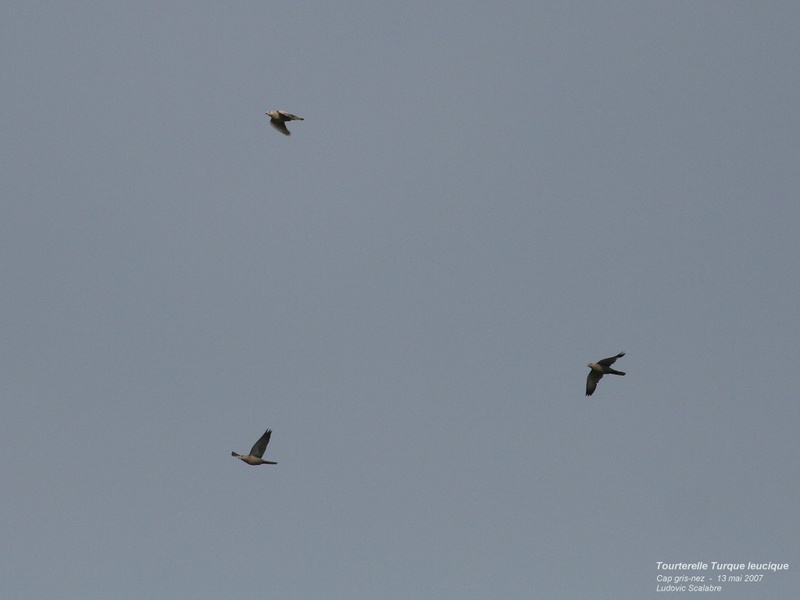 Very good migration for Black-throated divers (204 ind. ), 2nd best ever for automn, with 31 Red-throated Divers and 1 Great-northern Diver. Only 1 Fulmar. Again some shearwaters with 9 Sooty Shearwaters and 1 Manx Shearwater. 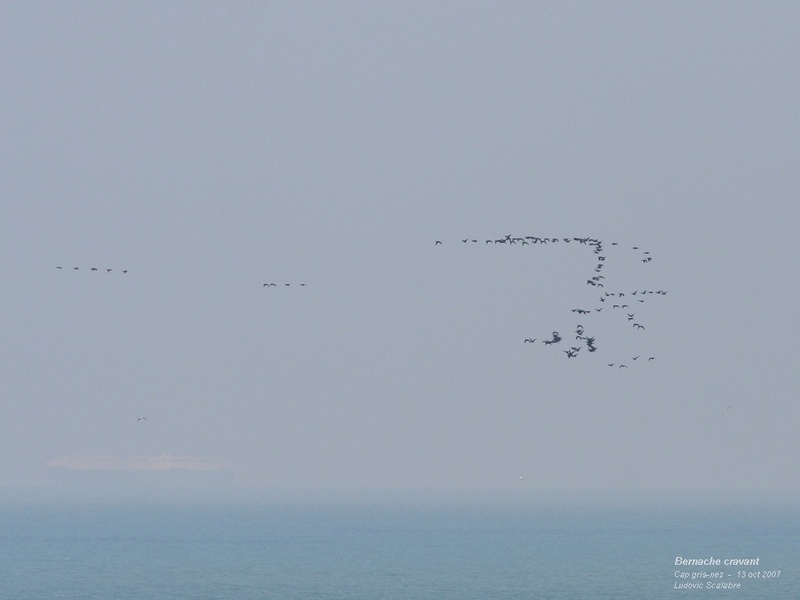 Globaly few ducks except for Brent Geese (851 ind. 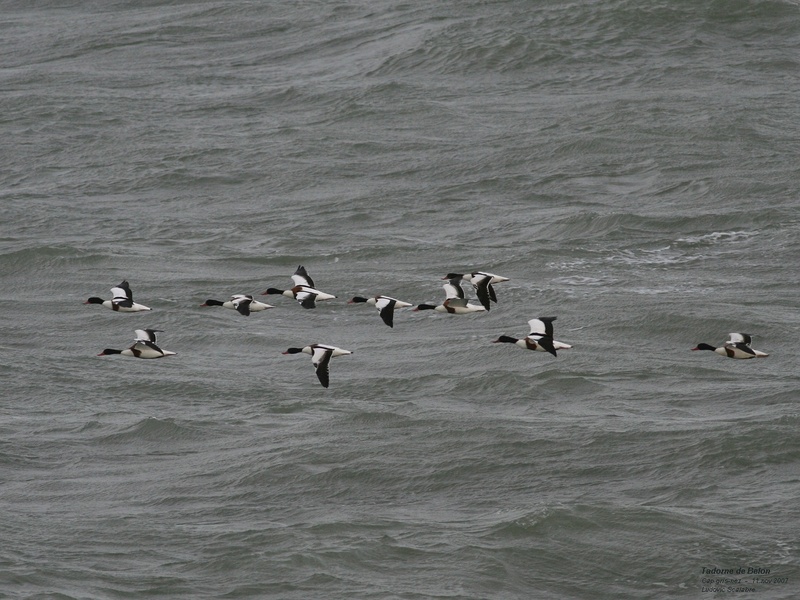 ), 251 Shelducks, some other species are 3 Velvet Scoters, 131 Common Scoters, 42 Red-breasted Merganser, 1 Goosander. Few waders but an other time 9 Purple Sandpipers (very common this year) and 1 Grey Phalarope, 177 Dunlin. 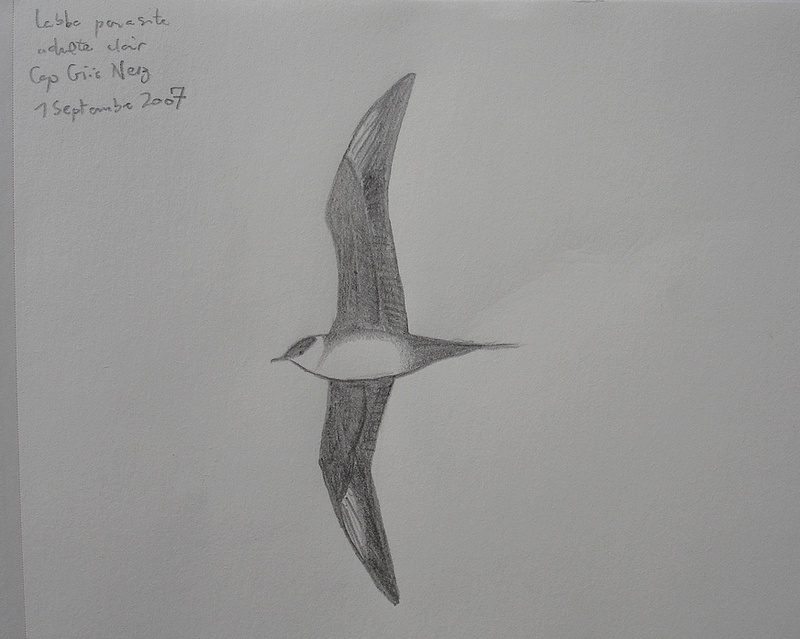 Very good passage for Pomarine Skuas (141 ind. 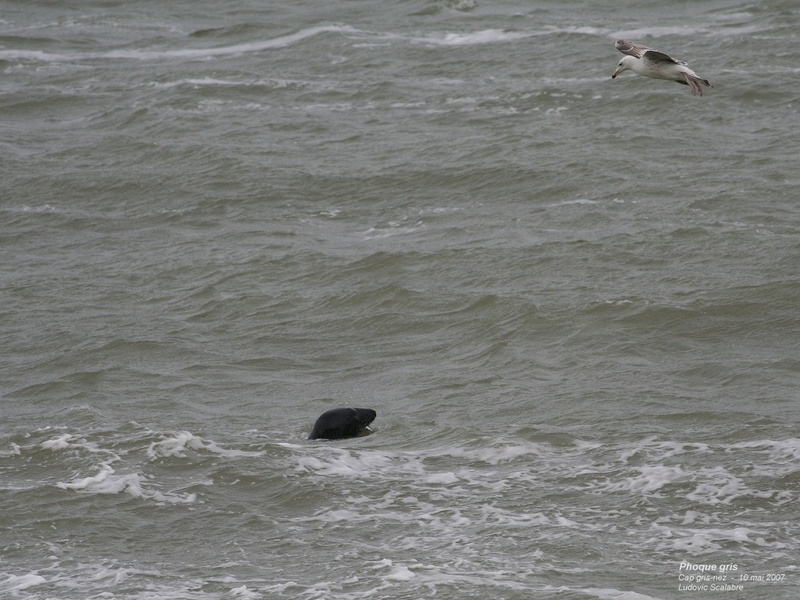 ), with 3 Arctic Skuas and 3 Great Skuas. Another explosion for Kittiwakes (12 200 ind.) and good mouvement for Little Gulls (550 ind.). Few auks but 2 good species with 24 Little Auks and 1 Puffin. 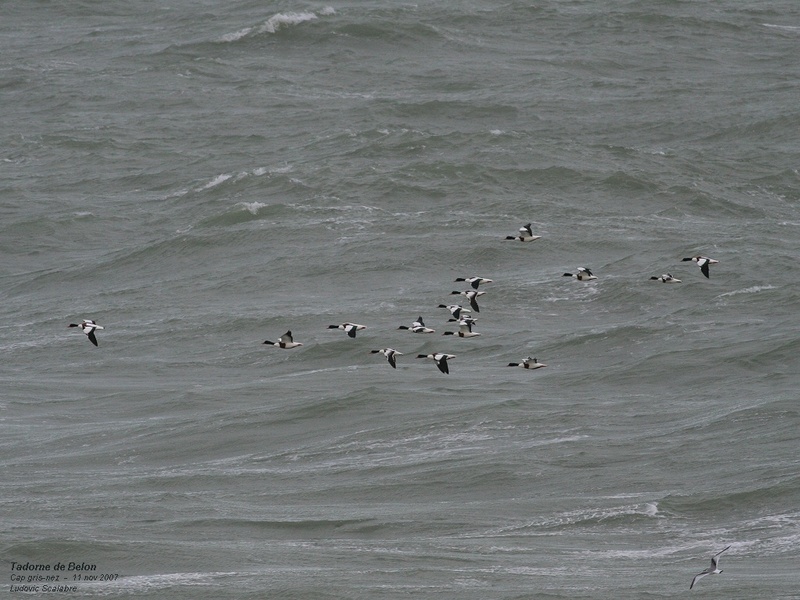 Exceptionnal weather conditions those last days and a new record for Little Auk with 84 birds today (previous record = 30 ind.). Few divers but 2 Great-northern Divers are notice today. Some grebes with 2 Red-necked Grebes. Few shearwaters with 5 Sooty Shearwaters and 2 Manx Shearwaters. Good numbers for some ducks species with 638 Brent Geese, 168 Shelducks, 7 Eiders, 245 Scoters, 3 Velvet Scoters, 30 Red-breasted Merganser. 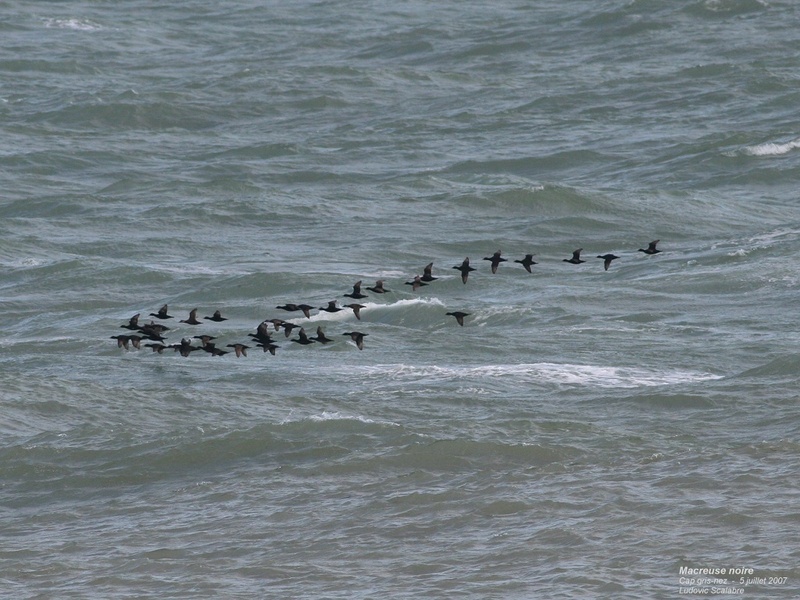 Not a lots of skuas but 23 Pomarines Skuas, 2 Arctic Skuas and 2 Great Skuas. Numbers and species for gulls and auks are today classic for the period except for 1 Sabine's Gull and 2 903 Kittiwakes. 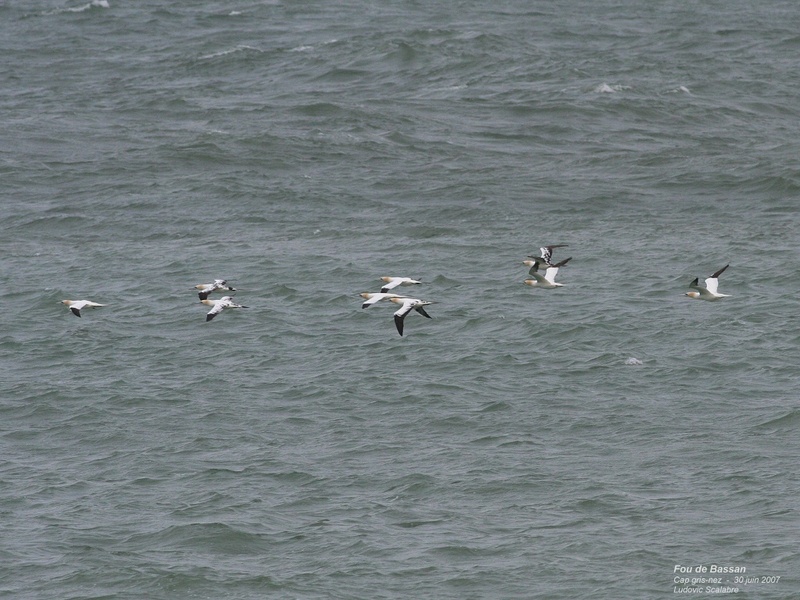 As espected, amazing passage today with 42 091 sea birds and 2 new spot records !!!!! Few divers with 23 Red-throated Divers and 11 Black-throated. 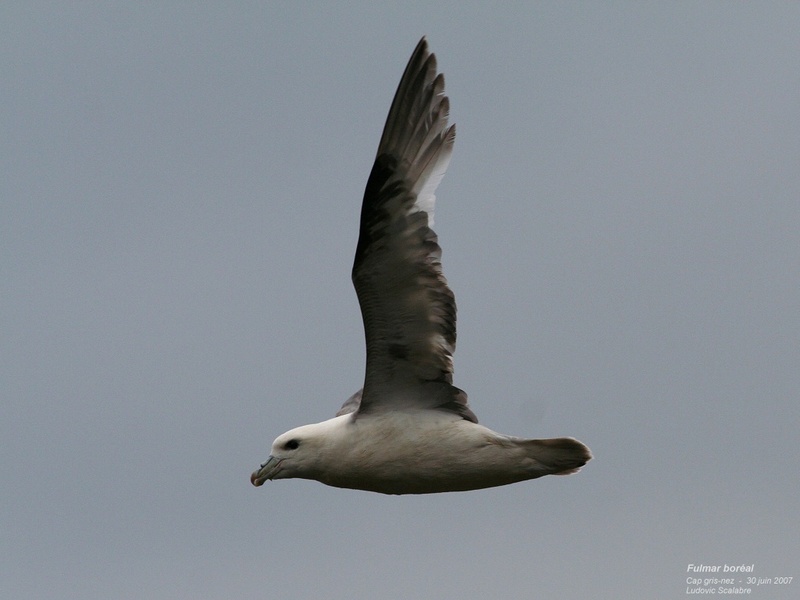 Return of the Fulmar boréal (3 ind). 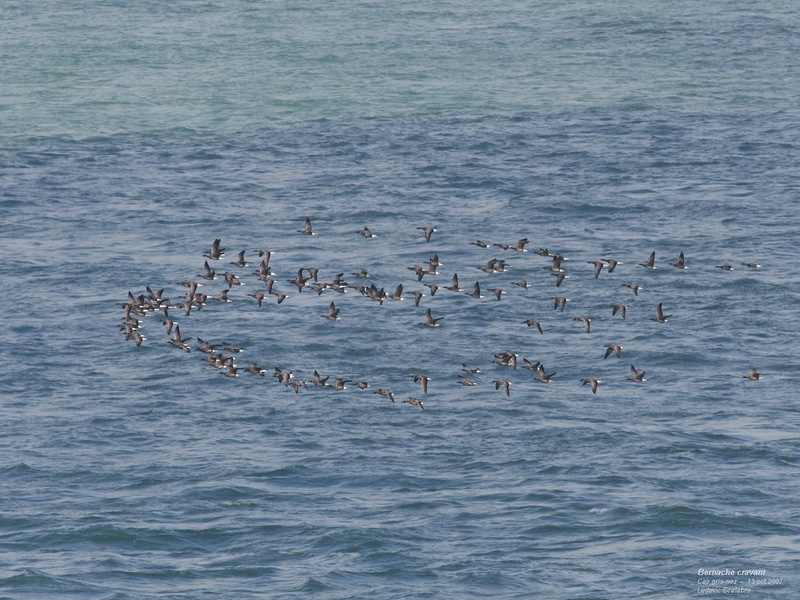 Good numbers for Sooty Shearwaters (42 ind.). 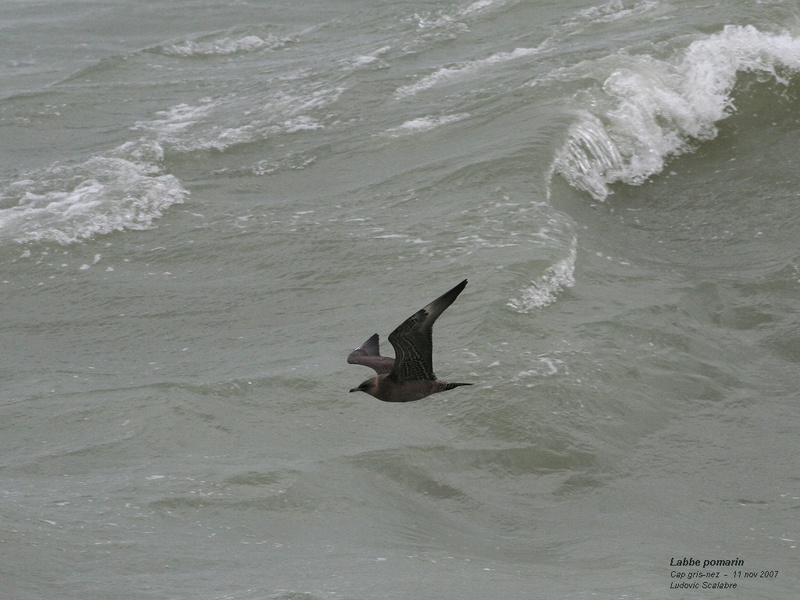 Petrel still difficult to sea at cap gris-nez, today 1 Leach's Petrel and 1 Storm Petrel (few data's in autumn). 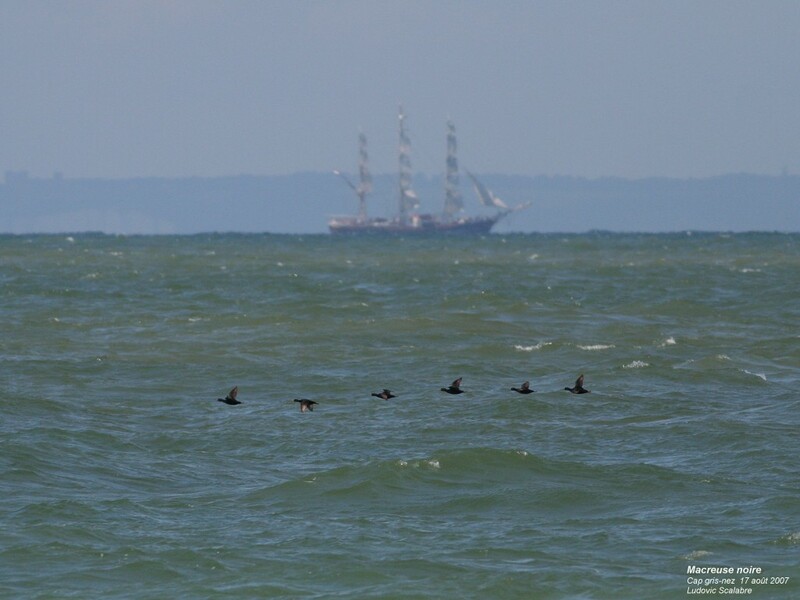 Very important migration fot Gannets (16 189 ind.) (3rd best-ever record, record = 16 389 !). Few ducks but 1 Goosander is notice (Scarce at sea). Few waders but another time 5 Grey Phalaropes. 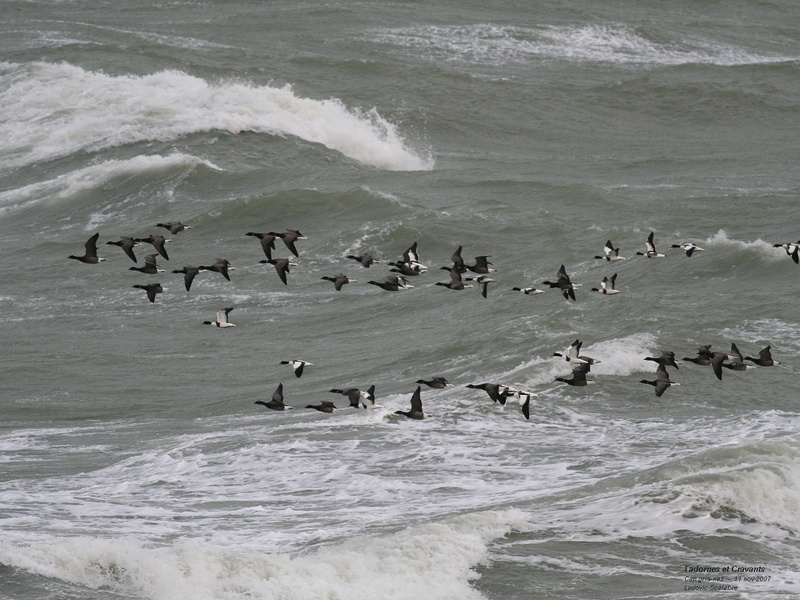 New record with 362 Pomarines Skua, good numbers for Great Skua for the date (130 ind. 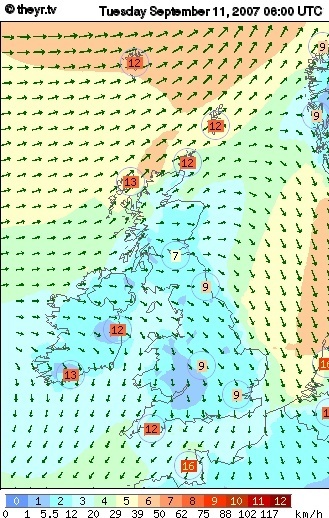 ), and 4 Arctic Skua are notice. Big numbers for gulls with 3 817 Little Gulls and a new record with 17 201 Kittiwakes (previous record = 7 760). Good numbers for auks (3 361 individus) with 24 Guillemots, 30 Razorbills, and 3 Little Auks. 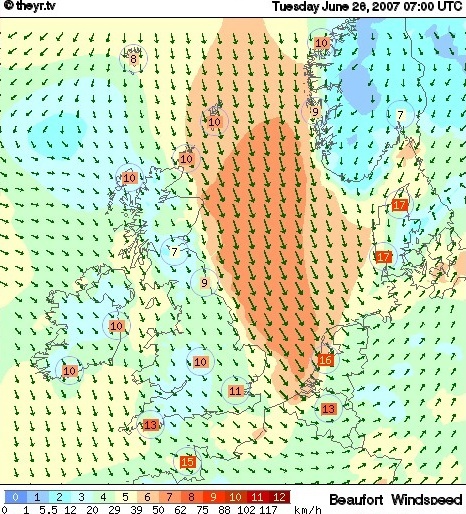 Another time, very good conditions are forecast for tomorrow 8th november with a local NW5-6 Bft but very stormy conditions in North sea with NW 7-9 Bft !!!!!!!!!!!!!! Encore quelques très bonnes données aujourd'hui. Peu de plongeons avec 31 Plongeons catmarins et 3 Plongeons arctiques. Quelques grèbes sont notés avec 20 Grèbes huppés, 2 Grèbes esclavons, 1 Grèbe à cou noir, également quelques Puffin fuligineux (3 ind.). Passage moins marqué pour les anatidés avec entre autres 333 Bernaches cravant, 1 Harelde boréale, 372 Macreuses noires, 3 Macreuses brunes. Quelques limicoles avec 5 Huîtriers pie, 1 Pluvier argenté, 10 Bécasseaux maubèche, 13 Bécasseaux sanderling, 8 Bécasseaux violets (vus seulement à l'unité ces dernières saisons), 281 Bécasseaux variables et 6 Courlis cendrés. Encore quelques labbes dont 28 Labbes pomarins (il faut signaler que de nombreux individus ont été vus en vol nord aux Pays-bas ce même jour), également 1 Grand Labbe et 1 Labbe parasite. Passage encore bien marqué pour les laridés avec 211 Mouettes pygmées, 2 766 Mouettes tridactyles, à nouveau 1 Goéland bourgmestre (adulte ). 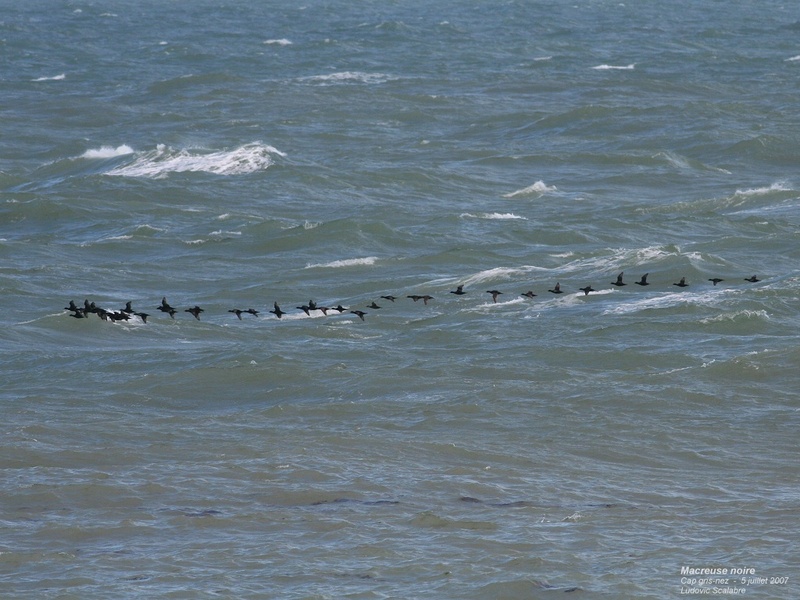 Passage bien moins marqué pour les alcidés avec environ 1 000 individus dont 36 Guillemots de Troïl, 76 Pingouins torda, 2 Mergules nains et encore un Macareux moine. A very good passage today despite no birds during the first 3 hours. Good numbers for divers with 128 Red-throated Divers and 84 Black-throated. 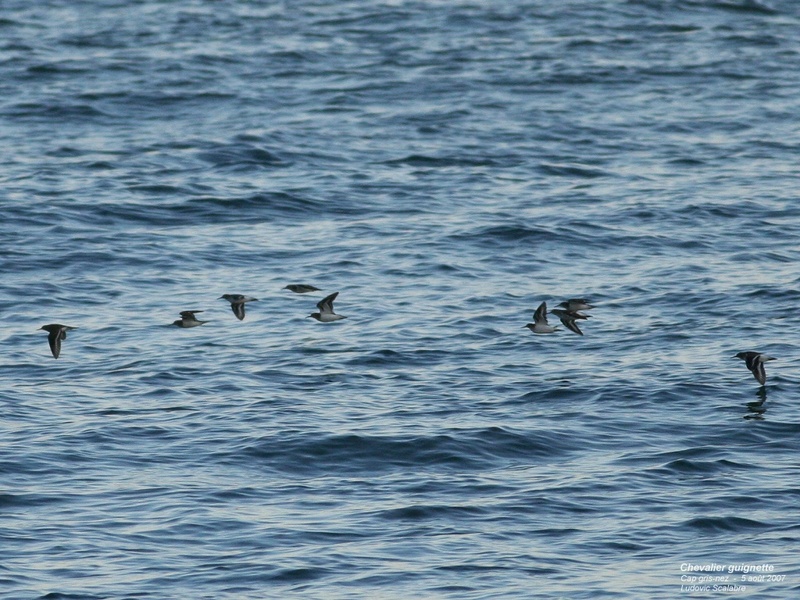 Few Sooty Shearwaters (9 ind.) passage could be better at this period. Lots of ducks with 454 Brent Geese, 11 Wigeons, 6 Teals, 1 Shoveler, the 2 first Scaup of the season, 4 Eiders, the 2 first Long-tailed Ducks, 1 172 Scoters, 8 Velvet Scoters, and the first good passage for Red-breasted Merganser (91 ind.). Few waders but 5 Greys Phalaropes (2nd best ever count). 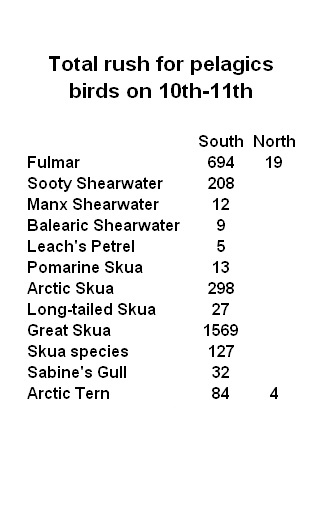 Very good mouvements for Pomarine Skuas with 192 individus (2nd best ever), 19 Great Skuas and 1 Arctic Skua. Lots of gulls with 1 172 Little Gulls, 2 122 Kittiwakess, the 1st Glaucous Gull (juv) and 1 Sandwich Tern. Big numbers for auks with 4 300+ birds with 42 Guillemots, 89 Razobills, 1 Little Auk and the 1st Puffin for the season (very close). 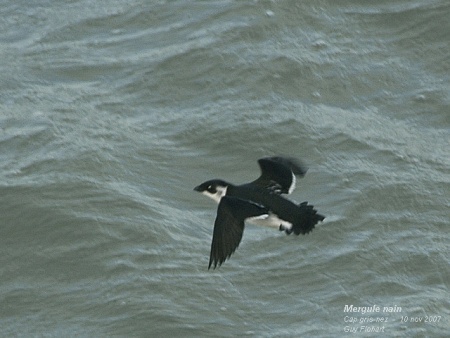 Big numbers for Pomarine Skua and Little Auks and good passage for pelagics is espected !! Very good passage despite no winds conditions. 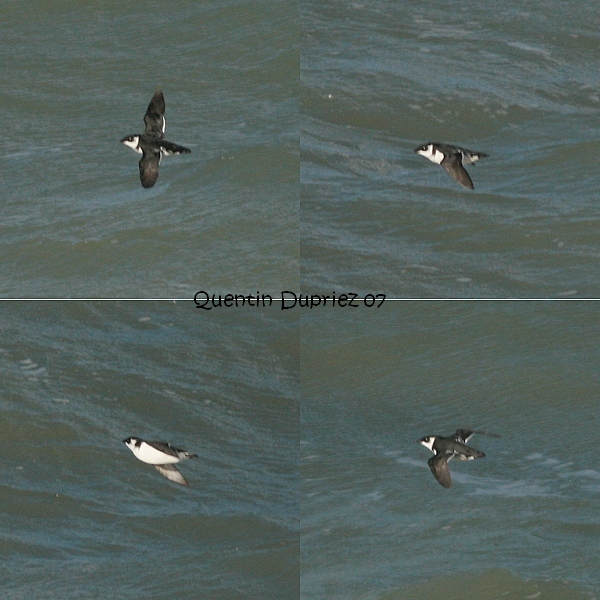 The good NW winds of yesterday that produced good counts at le clipon and calais (but no counts on the cap !!!!) explain probably the total of the day. 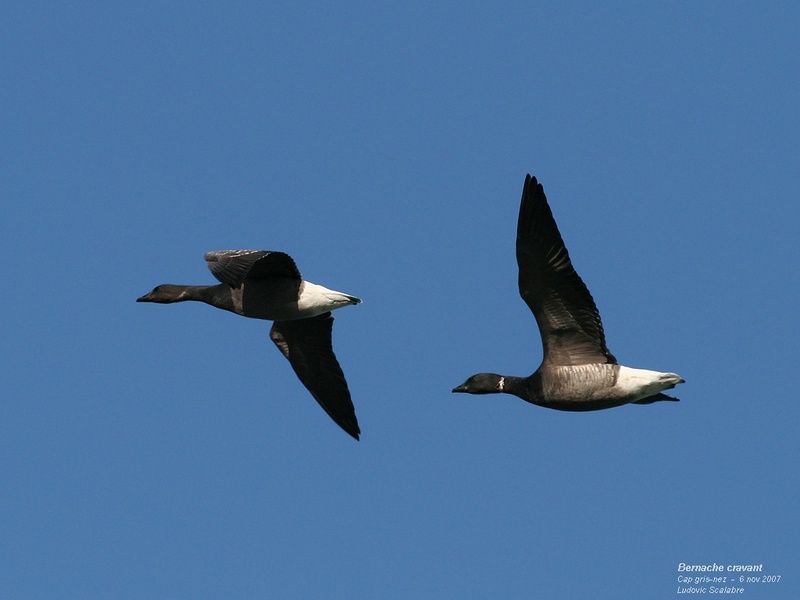 Better numbers for divers with 74 Red-throated Divers and 35 Black-throated Divers. Some grebes with 5 Red-necked Grebes. Good movements for ducks with 14 species 5 267 Brent Geese (new record for automn), 2 Greylag Geeses, 7 Egyptian Geese, 12 Shelducks, 102 Wigeons, 12 Teals, 21 Pintails, 22 Shovelers, 1 Tufted Duck, 5 Eiders, 1 223 Common Scoters, 6 Velvet Scoters, 1 Goldeneye and 12 Red-breasted Megansers. 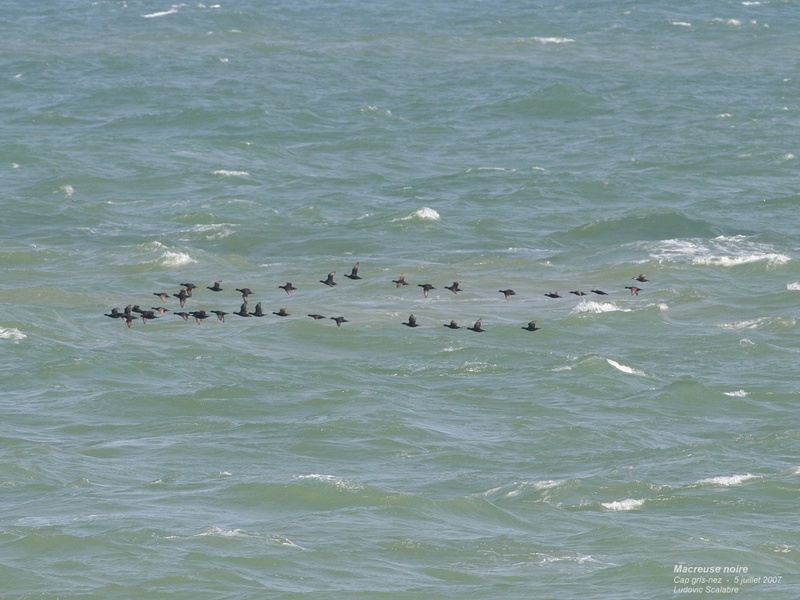 Good numbers for skuas with 58 Pomarine Skuas (imm), 6 Great Skuas and 22 Skuass species (probably Pomarine). Few gulls and terns with 124 Little Gulls, 249 Kittiwakes and 1 Sandwitch Tern. 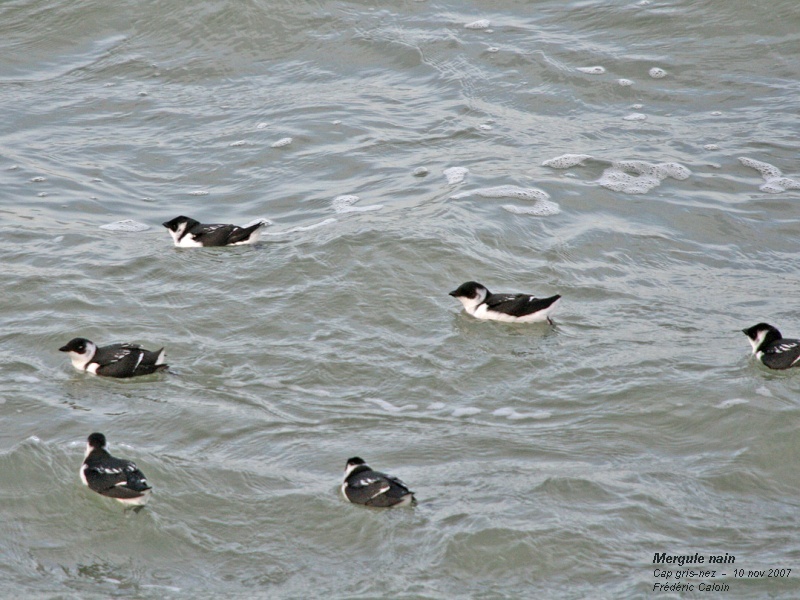 Usual movement for auks(600 ind.) with 15 Guillemots, 62 Razorbills and 1 Little Auk. Some good passerines with 352 Sky Larkss (only over sea are counted), 2 Twites, 2 Lapland Buntings and 1 Snow Bunting. 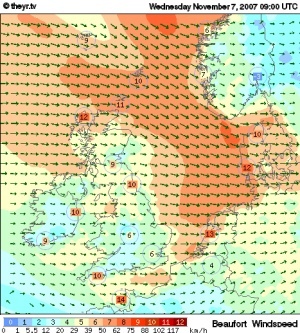 Good movements for seabirds today with good winds conditions. Few divers with 30 Red-throated Divers, 4 Black-throated Divers and the 1st Great northern Divers for the automn. Few grebes with 2 Red-necked Grebe. 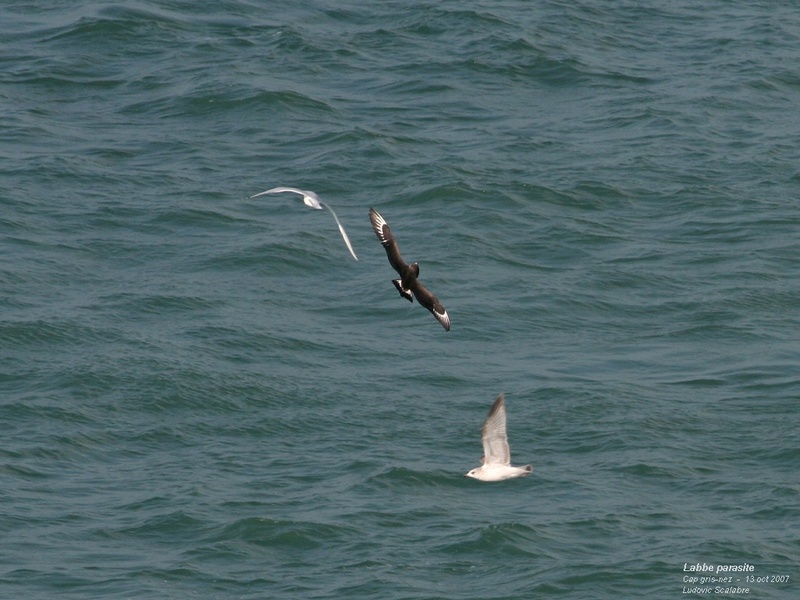 Good movements for Sooty Shearwaters (33 ind.). Few ducks with 101 Brent Geese, 152 Common Scoters and 5 Red-breasted Merganser. Few shorebirds with 1 Purple Sandpiper and 1 Grey Phalarope. 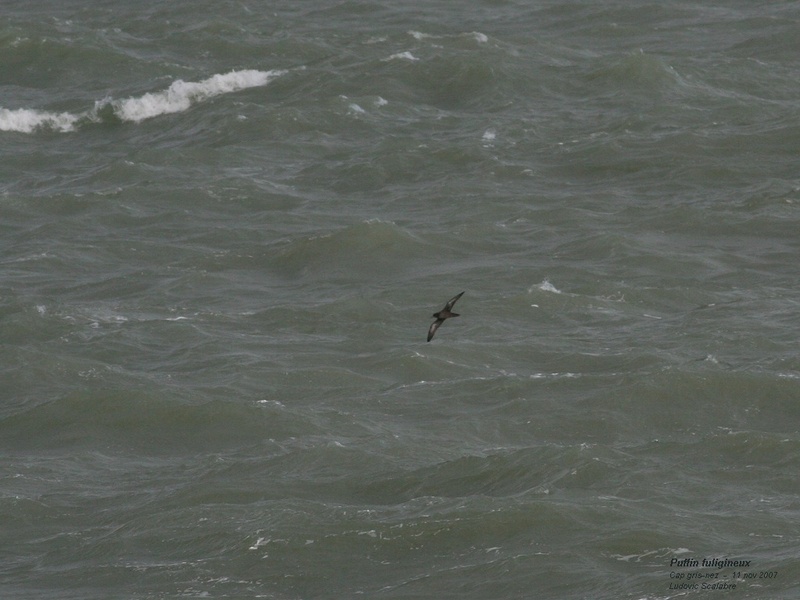 Good nombers for skuas with 9 Pomarine Skuas (1 Subad + 8 juv), 1 Long-tailed Skua, 4 Arctic Skuas and 13 Great Skuas. Few gulls and terns 16 Mediterranean Gulls, 184 Little Gulls, 1 Sabine's Gull (juv), 168 Kittiwakes and 3 Sandwitch Terns. 800 Auks today with much Guillemots than Razorbills and 2 Little auks. 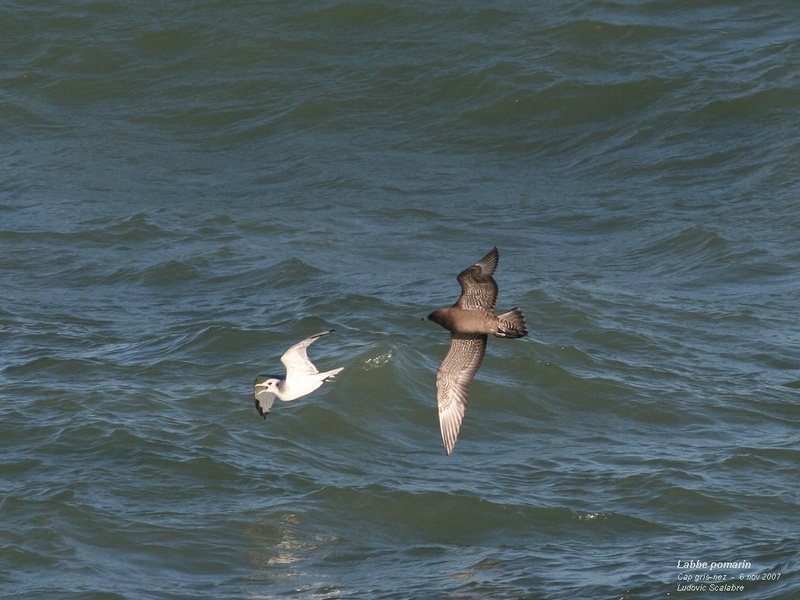 For the anecdote, 1 Peregrine fight a Sooty Shearwater 2 times and one of the two Little Auks. Few birds to report. 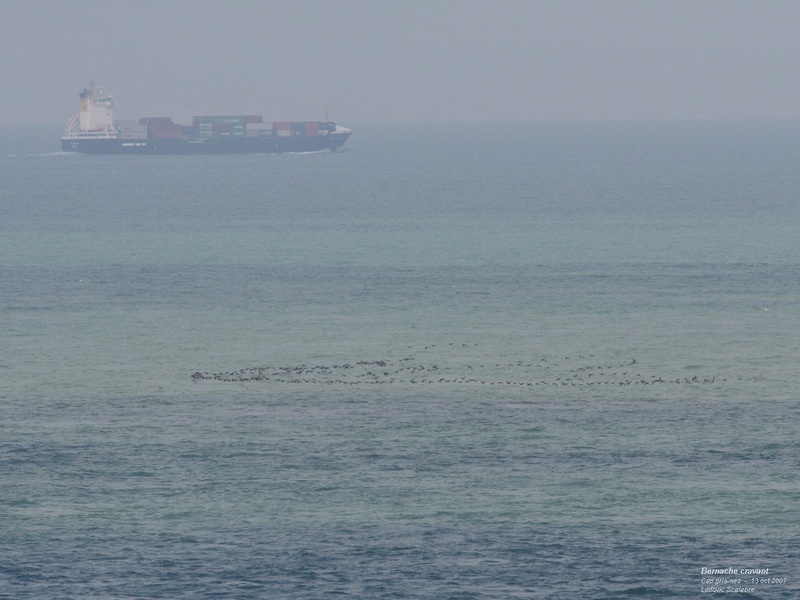 Few divers with 28 Red-throated Divers and 23 Black-throated Divers. 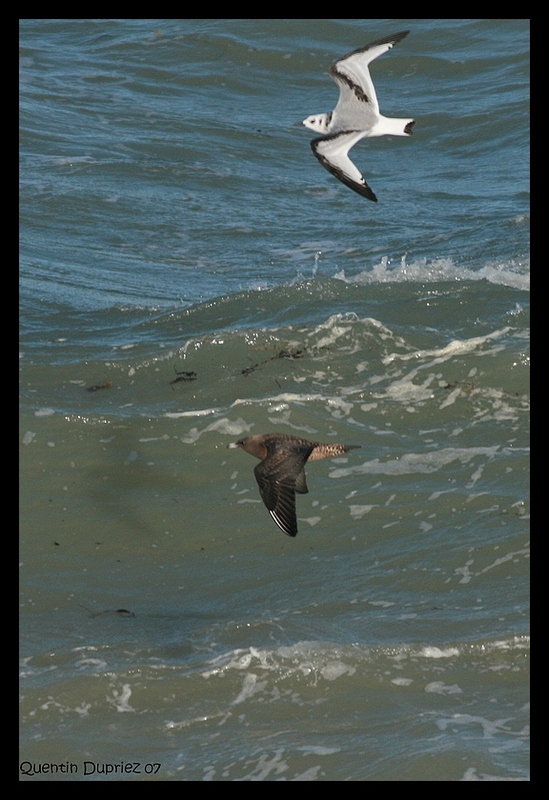 2 Arctic Skuas and 1 Great Skua. Few ducks, shorebirds and gulls. Some movement for auks with 384 Auks species (flying north), 3 Guillemots, 158 Razorbills and a good surprise with 1 Little auk despite poor winds conditions today and the days before. Some good passerine with 2 Barn Swallows, 1 Mistle Thrush, 2 Redpolls, 2 Lapland buntings and some common species for the period. 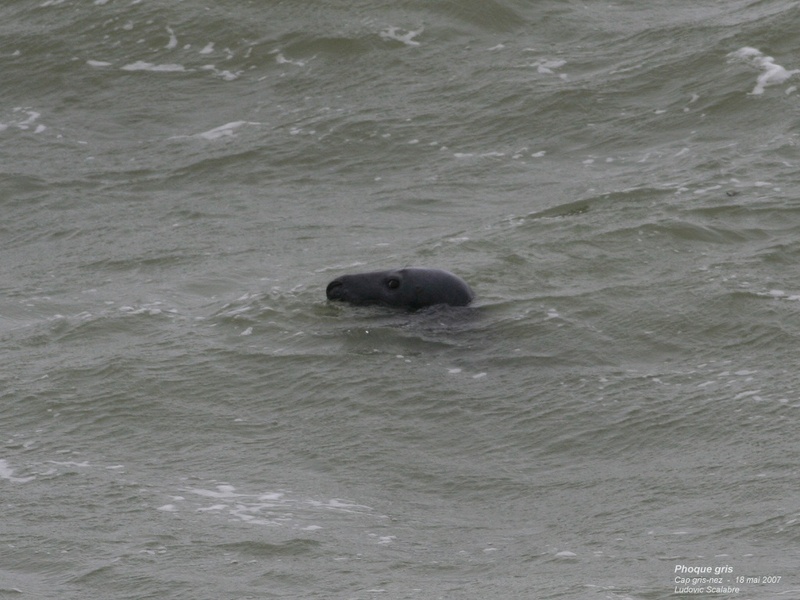 Good passage today but poor conditions of observation (Birds at great distance because of north winds). Few divers and grebes with 19 Red-throated Divers, 7 Great-crested Grebes and 2 Red-necked Grebe. Good numbers for Gannets (672 ind.). Good day for Brent Geese with 1 610 birds. Few ducks except 605 Common Scoters. 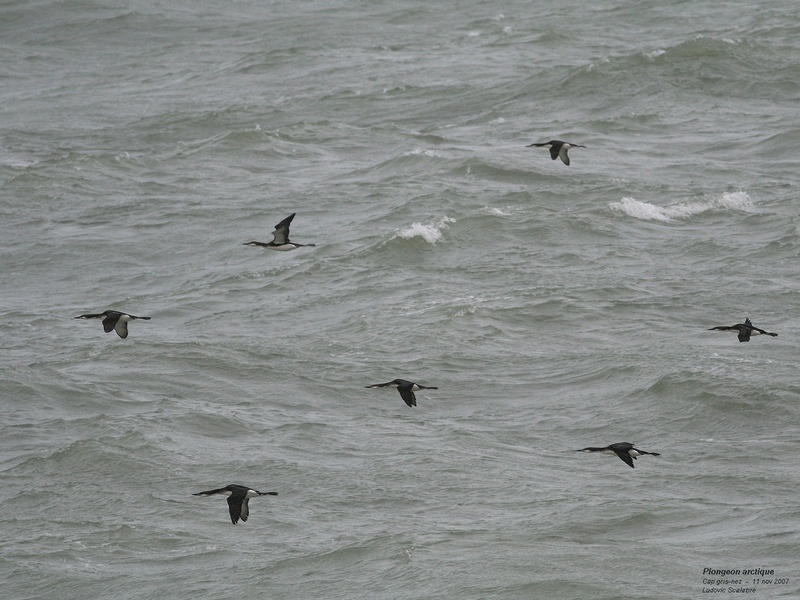 Good numbers for skuas 20 Pomarine Skuas (8 ad), 18 Arctic Skuas, 1 Long-tailed Skua (juv) and 9 Great Skuas. 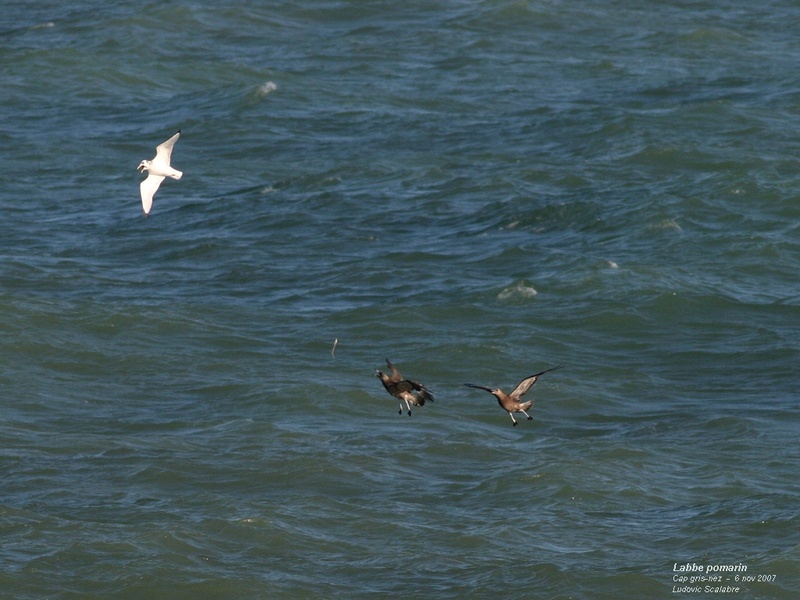 Some terns (units) and good movement for Little Gull (547 ind.). Lots of auks with 1 671 auks species, 2 Guillemots and 31 Razorbills. Very good seance despite the ENE light winds. 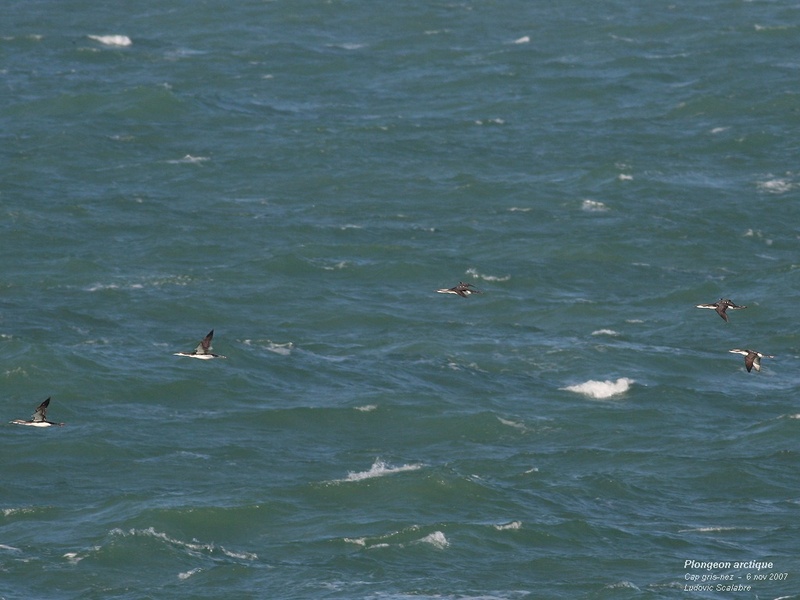 Some divers with 8 Red-throated Divers and 5 Black-throated Divers (3 ad summer plumage), and 1 Red-necked Grebe. Good numbers for Gannets (1 071 ind.). A flight of 10 Spoonbills (juveniles), only 1-3 mentions per year. 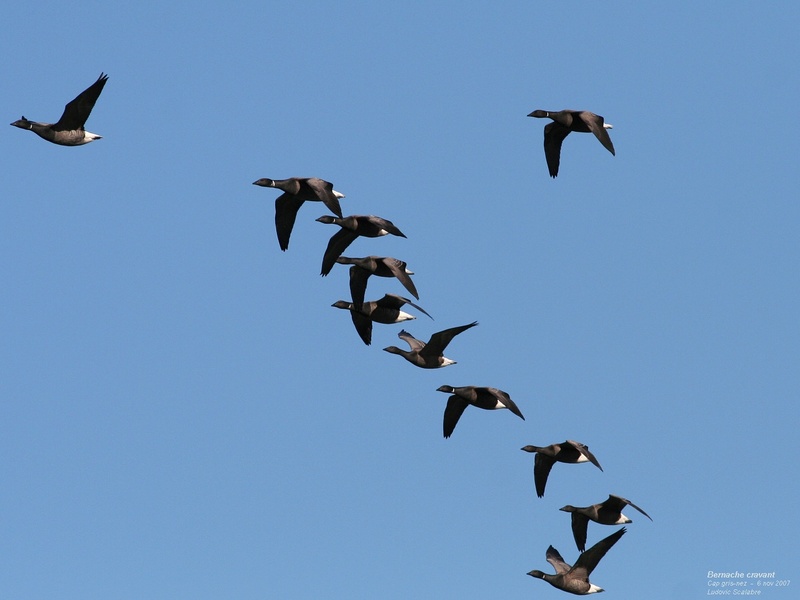 Very good movement for Brent Geese (2 943 ind) higher numbers beetween 12A.M. and 2 P.M with a flock of 500+ Birds !! . 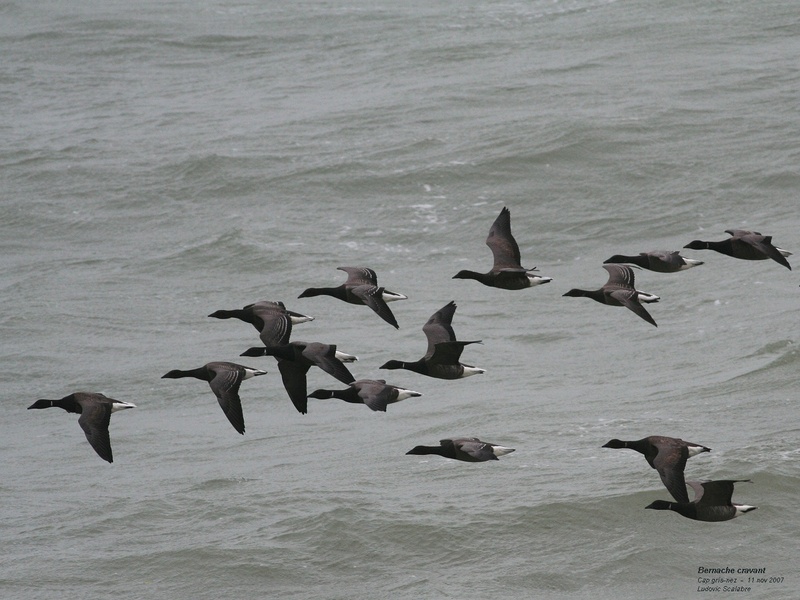 Good numbers for Common Scoter (1 027 ind. ), few ducks for others species. 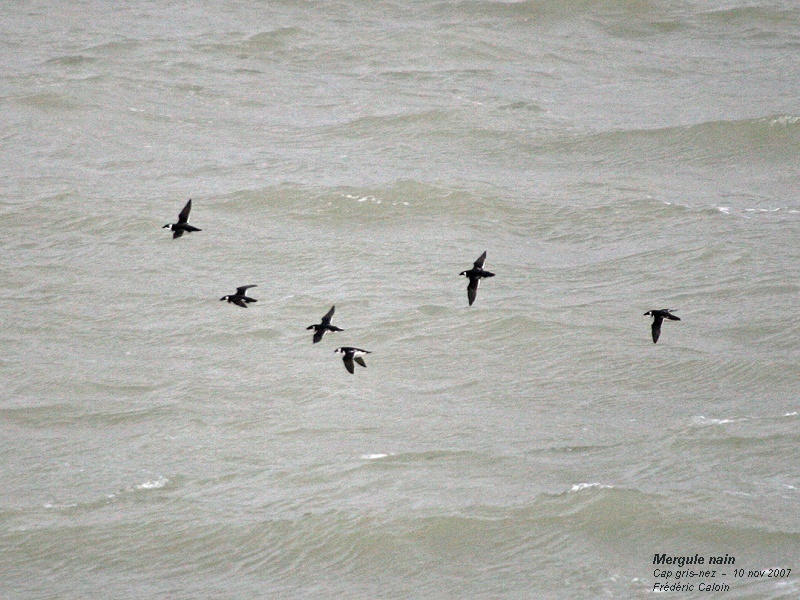 Few skuas with 2 Pomarine Skuas (1 ad), 7 Arctic Skuas and 5 Great Skuas. Few gulls but a new Sabine's Gull (juv). Good numbers for auks (700 Birds), few birds could be positively specified (3 Guillemots / 36 Razorbills), but majority of far birds seems to be Razorbills. 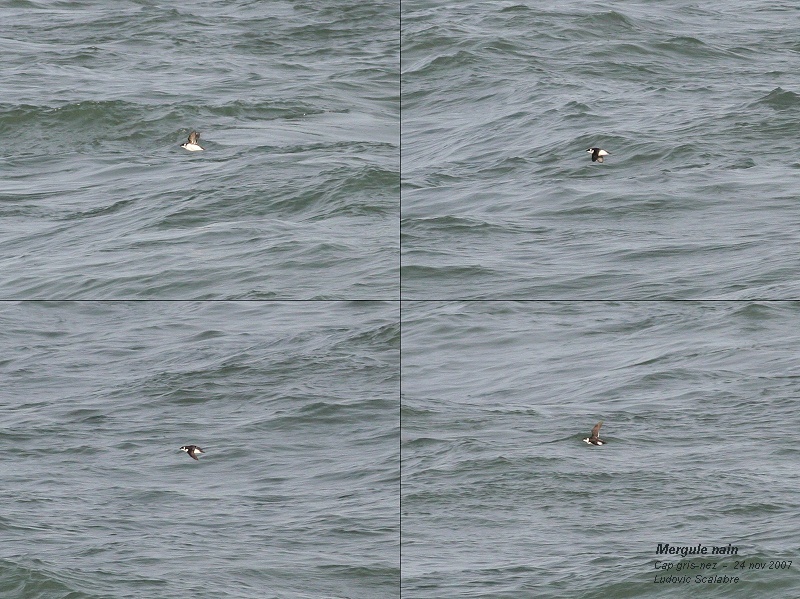 4 Sooty Sheawaters, 2 Grey Phalarope (1 ind. sitting on sea), 4 Arctic Skuas (flying notrh), 4 Great Skuas (3 flyong notrh), and 1 Sabine's Gull. Good variety for ducks with 19 Brent Geese, 9 Shelducks, 5 Wigeons, 16 Teals, 5 Mallards, 4 Pintails and 430 Common Scoters. As usual by good SW winds, lots of birds are seen close to the shore, specially for waders (11 differents species today) and terns. ; 109 Oystercatchers, 182 Ringed Plovers (2nd best ever count), 6 Grey Plovers, 91 Knots, 27 Sanderlings, 2 Little Stints, 258 Dunlins, 121 Bar-tailed Godwit, 3 Redshanks, 15 Turnstones. For gulls and ters ; 3 Little Gulls, 11 Mediterranean Gulls , 21 Kittiwakes, 129 Sandwich Terns, 963 Common Terns, 15 Arctic Terns, 26 Little Terns and 7 Black Terns. 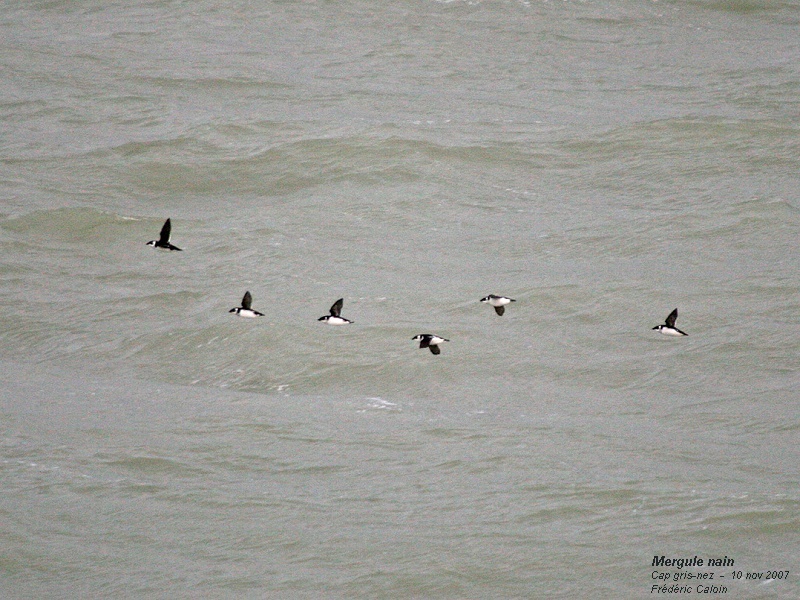 Another good migration for Auks (144 birds) with 35 Razorbills and 2 Guillemots. 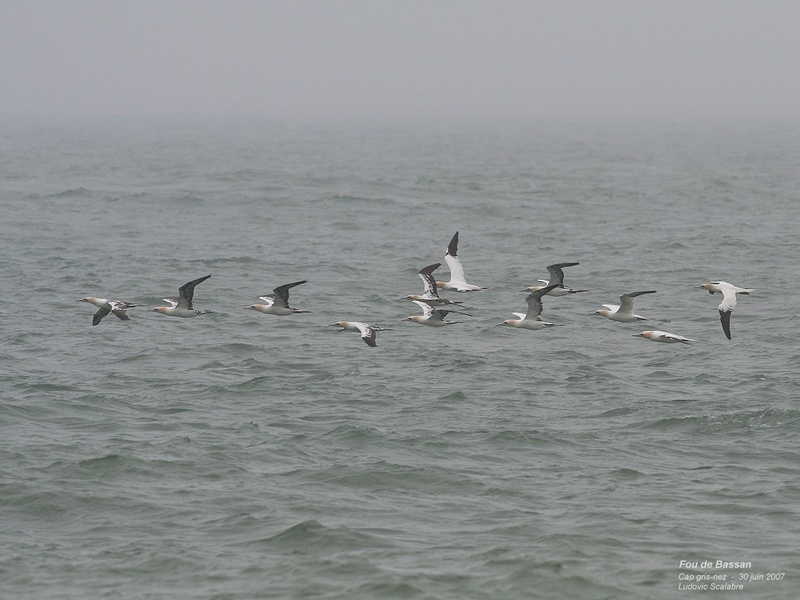 Good NNW conditions produced a good pelagics migration. Despite good winds, medium numbers for shearwaters (certainly because of strongs heat haze for sooty) with 35 Sooty Shearwaters and 19 Manx Shearwaters. Just 335 Common Scoters for species of ducks. Another very good movement for skuas 7 Pomarine Skuas, 165 Arctic Skuas, 7 Long-tailed Skuas, 502 Great Skuas and 32 Skuas species also 5 sabine's Gulls. First significative movement for Little Gull (210 ind. 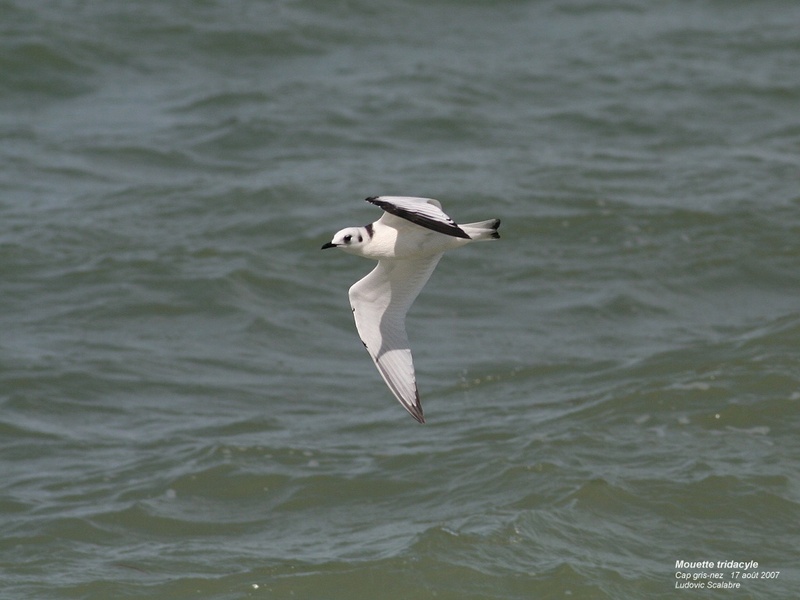 ), and Kittiwake (550 ind.). Very good numbers for Common Terns (3 900 ind. 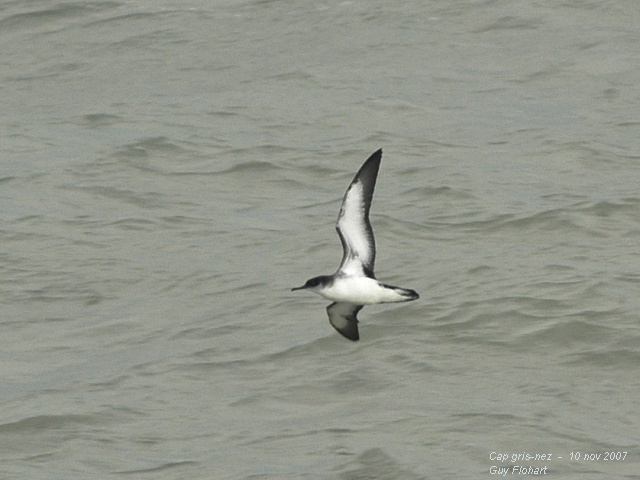 ), also 117 Arctic Terns (good numbers re regular this year), 505 Sandwich Terns and 1 Black Tern. Very good movement for auks (180 ind. ), 2 week before usual dates for such numbers. The weather forecast were promising and quite unique during this period for at least 4 years. The zone with high NW winds reach the Netherlands and Belgium between 2 and 4 pm (Map 2 = simulation at 8pm). Quite important distances between Westkapelle (NL), Le Clipon and Cap gris-nez, explain the different timing of the influx : 5 pm for Le Clipon and 6 pm for Cap gris-nez. Weather condition are still on the good way (in the morning at least). 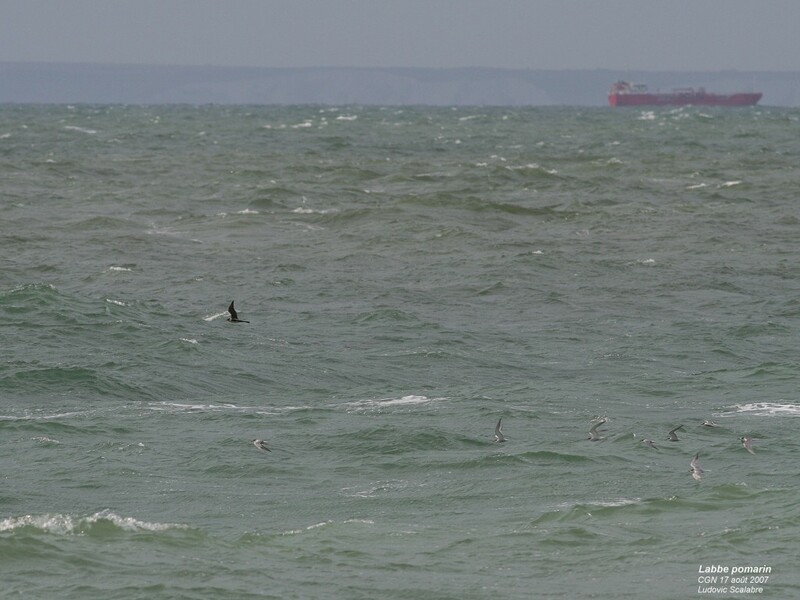 Unfortunately, lots of seabirds have undoubtly passed the Strait of Dover during the night or were going back north in the favor of calmer wind condition in the North Sea (at least true for Great Shearwater). 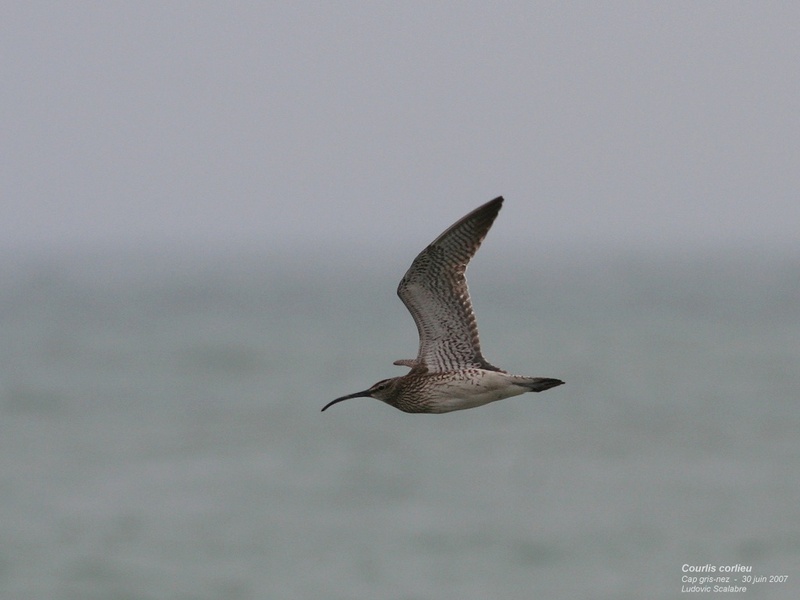 The passage is very quiet during most of the day on 10th September, even if some good birds were noted at distance. First big wave arrived around 4 pm alongside a big shower in off the sea. Sooty Shearwaters, Long-tailed Skuas and especially Bonxies came from overall (high in the sky, along the cliff and unfortunately also at big distances). Counting became suddenly very difficult. And then, another period of calm before the real explosion a little bit after 6pm (till the night). 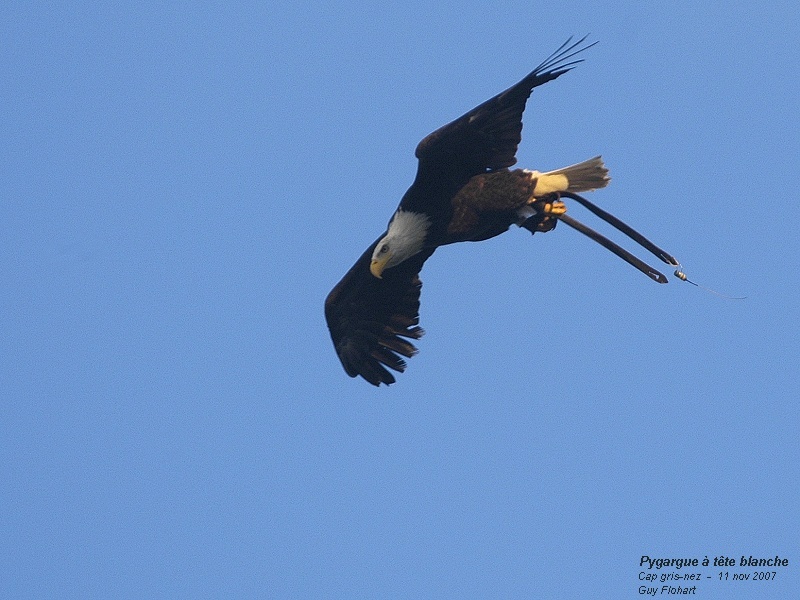 80% of the day observation were recorded in this 2 ½ hours period ! If this movement occured earlier in the day, no doubt that day-records would have been broken !! 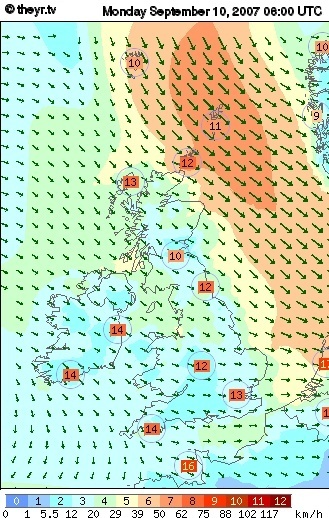 Of interest, wind fall almost completely after 7pm. 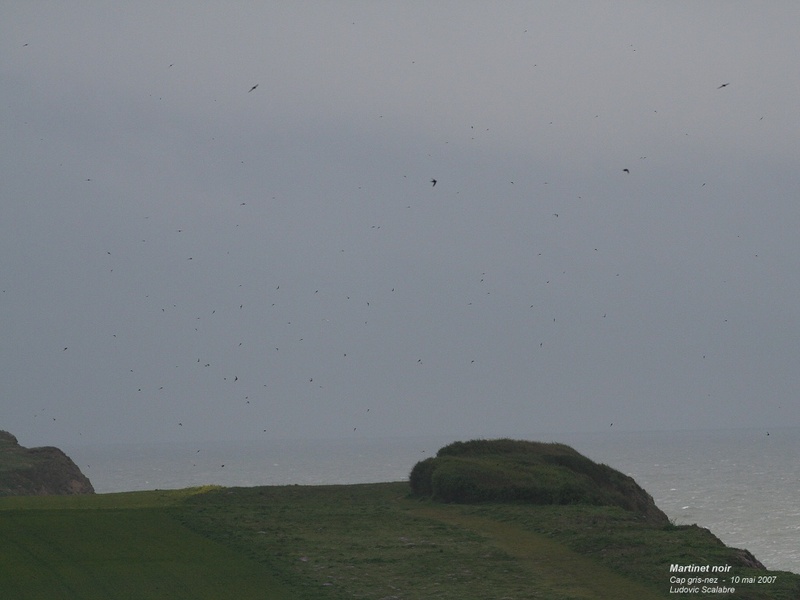 One hour before, the same influx occured at Le Clipon were observers counted more Norther Fulmar (1115) and Sooty Shearwater (405) due to a better timing. Other observation were quite similar. In the next morning (11th September), still lot of passage on both sites at the favour of maintaining good weather condition. 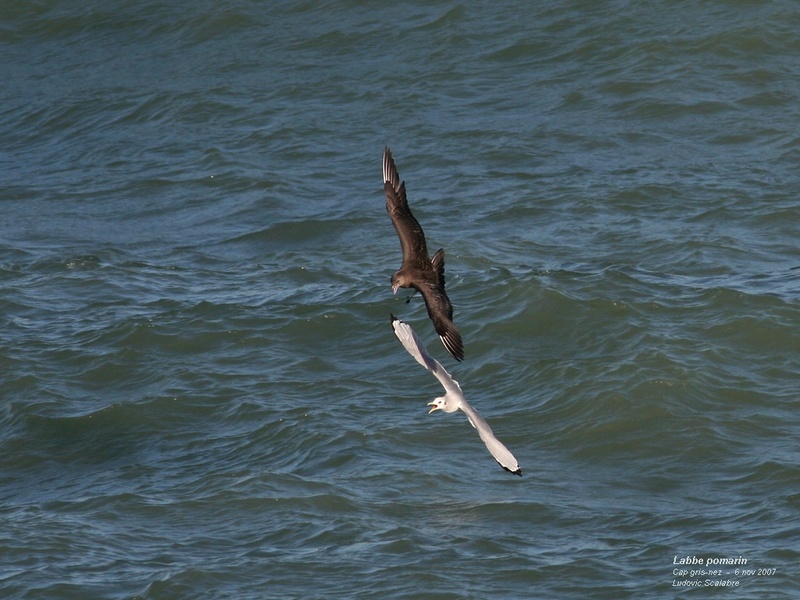 Unfortunately, only a part of the Fulmar movement seen the previous day at Le Clipon is recorded (587 birds) and only small numbers of Sooty Shearwaters were seen (normally seen in higher numbers than Le Clipon). 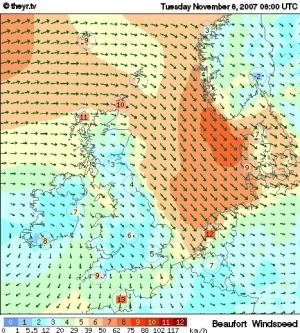 Once the high winds stopped in the evening of 10th, lots of seabirds could have choosen to go back in a northerly direction accross the North Sea to take back their classic route. 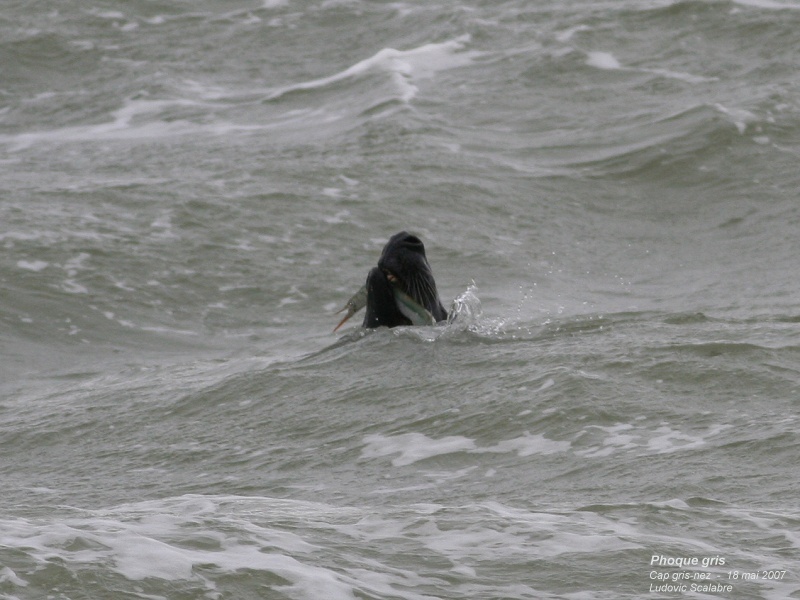 This is unfortunately the case of Great Shearwater (seen in different location along the east coast of United Kingdom and in the Netherlands) and also may be for the Norther Fulmar. 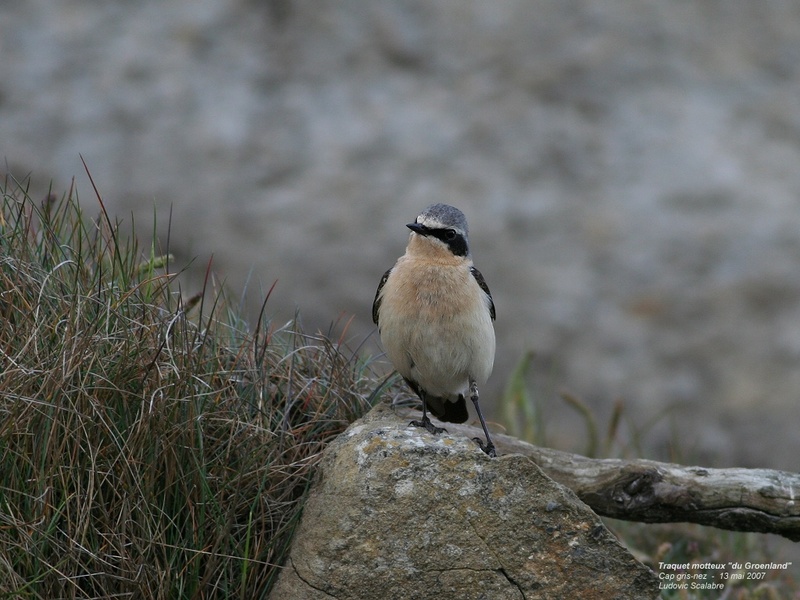 Lots of birds could have stopped their migration when they enter the calmer zone in order to rest and feed. 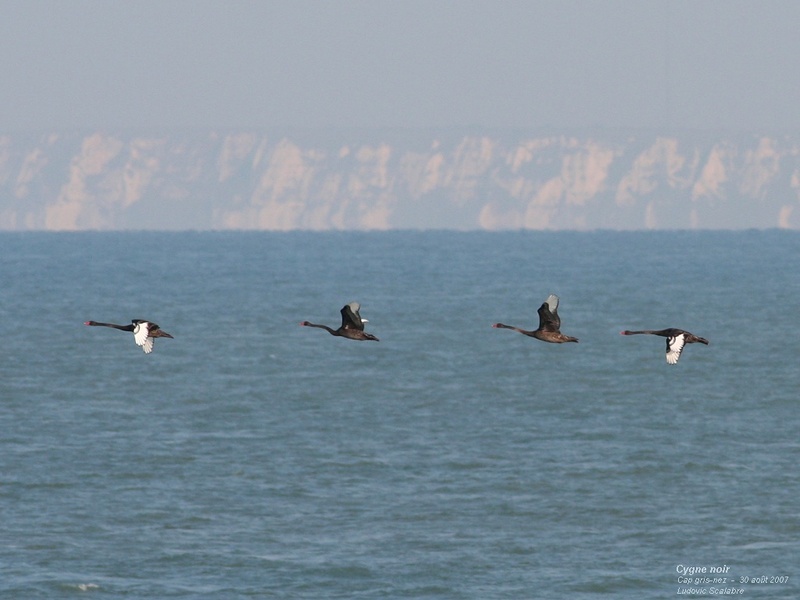 They migrated again when the winds blowed again during the night and then passed the Cap gris-nez during darkness. This can explaine the fact that good numbers of Sooty Shearwaters were recorded eastwards in Normandie (Gatteville) early the same morning. An other good day. 3 Red-throated Diver today. 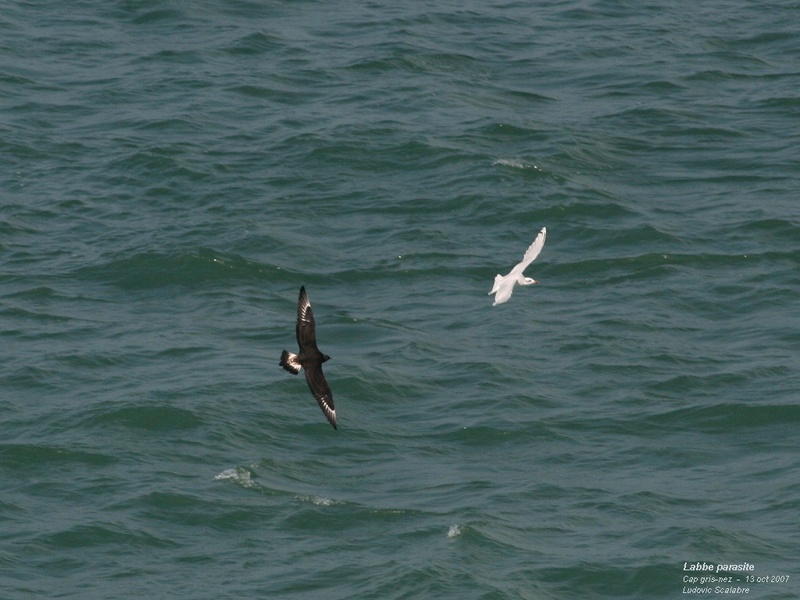 Important rush for Fulmar (600 ind.). Less shearwaters today with 16 Sooty Shearwaters, 3 Manx Shearwaters and 2 Balearic Shearwaters and 3 Leach's Petrels. Few duck with the 1st Brent goose and and Red-breasted Meganser this season, and 3 Shelducks, 17 Wigeons, 1 Gadwall, 16 Teals, 8 Pintails, 321 Common Scoters. Few waders. Again lots of skuas with 7 Pomarine Skuas, 114 Arctic Skuas, 16 Long-tailed Skuas (all juv), 577 Great Skuas and 43 Skuas species. An other good numbers for Sabine's Gull (16 ind juv). Others birds are 46 Little Gulls, 343 Kittiwakes, 522 Sandwich Terns, 876 Common Terns, 37 Arctic Terns, 13 Little Terns, 5 Black Terns, 2 Guillemots and 13 Razorbills/Guillemots. Very good winds conditions produced a big movement ! Fisrt imporant movement for the Fulmar (107 ind.). Very good numbers for shearwaters 192 Sooty shearwaters (good numbers 10days before usual good dates), 9 Manx Shearwaters and 6 Balearic Shearwaters and 2 Leach's Petrels. 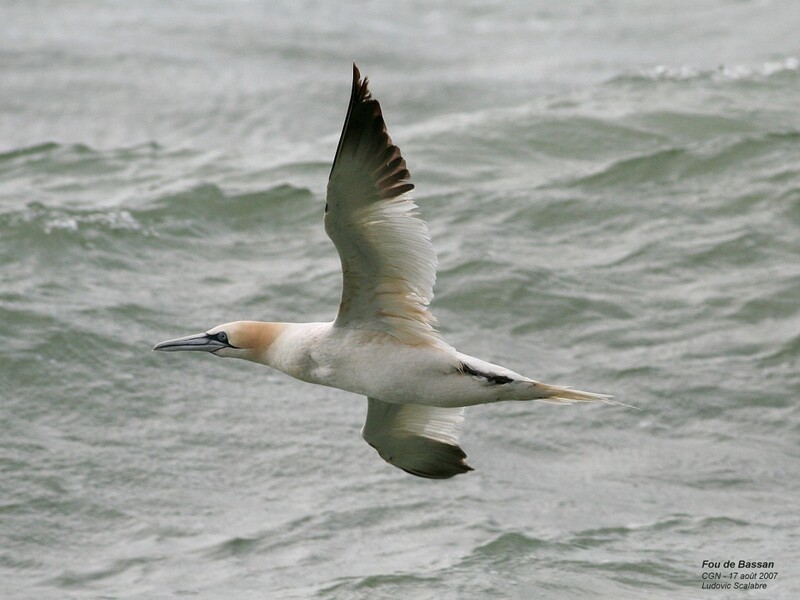 Gannets (420 birds) are well represented. Few ducks and waders but 7 Curlews Sandpipers. Lots of skuas with 6 Pomarine Skuas, 184 Arctic Skuas, 11 Long-tailed Skuas (1 adult), 992 Great skuas (2nd best ever count) and 84 Skuas species. 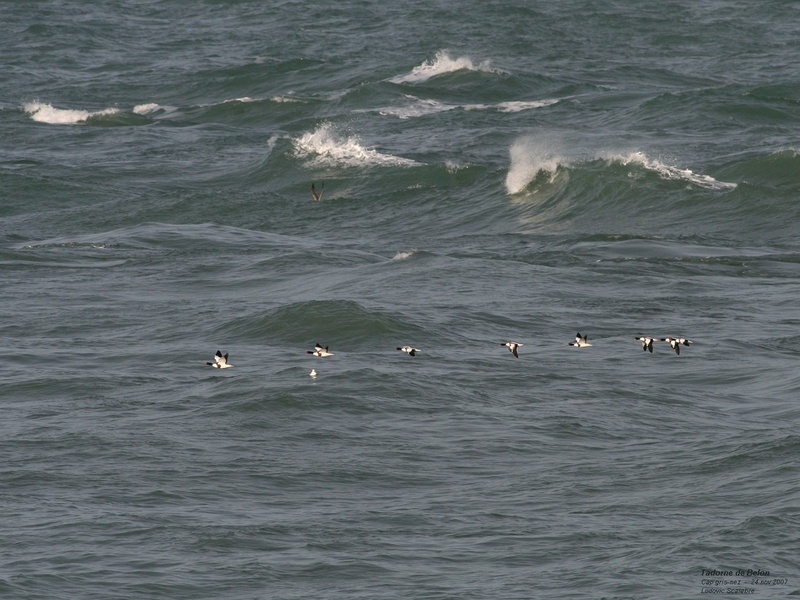 A very good movement for Sabine's Gull with 16 birds(1 adult). Numbers for gulls and terns are 10 Little Gulls, 181 Kittiwakes, 856 Sandwich Terns, 1540 Common Terns, 51 Arctic Terns, 17 Little Terns, 4 Black Terns. 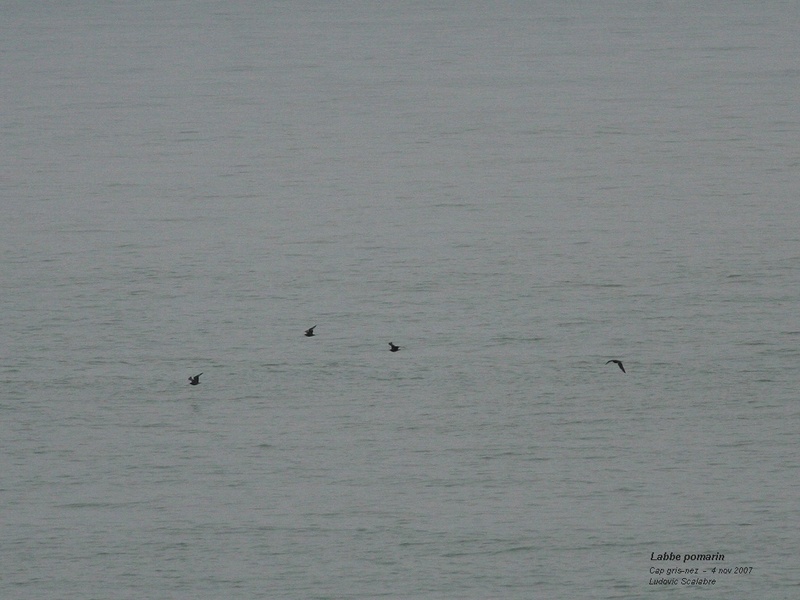 New spot record for Long-tailed Skua with 21 juveniles (80% dark morph). 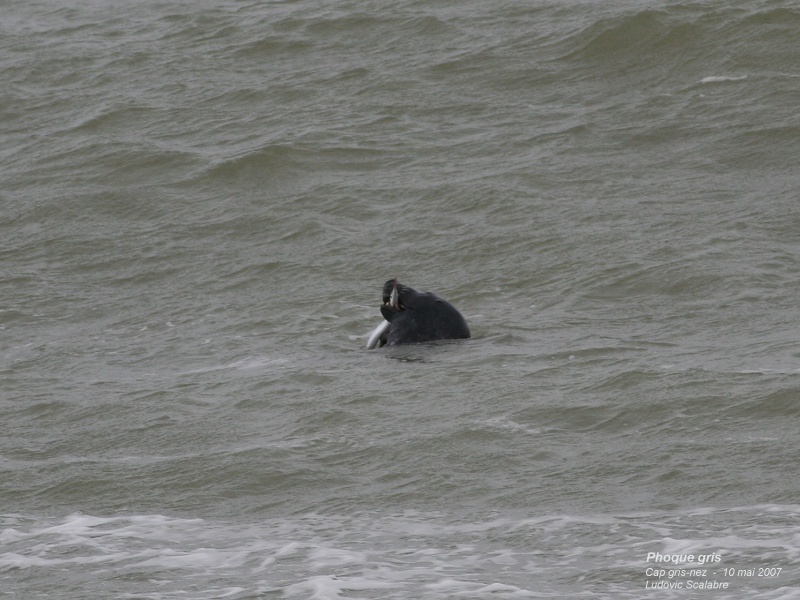 It seems that something is on the way with the juv Long-tailed Skuas in the souhtern part of the North Sea. 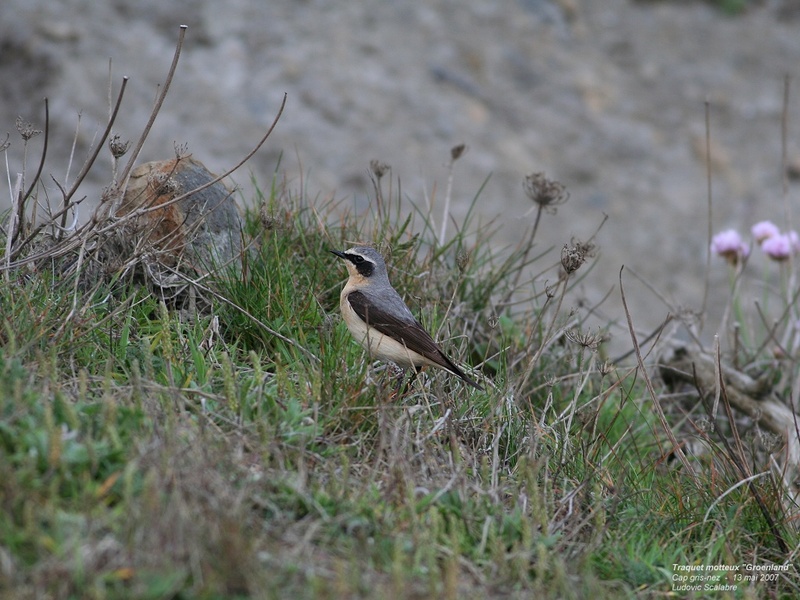 13 were seen yesterday from le Clipon (France) also good numbers at Westkapelle since 31st august. 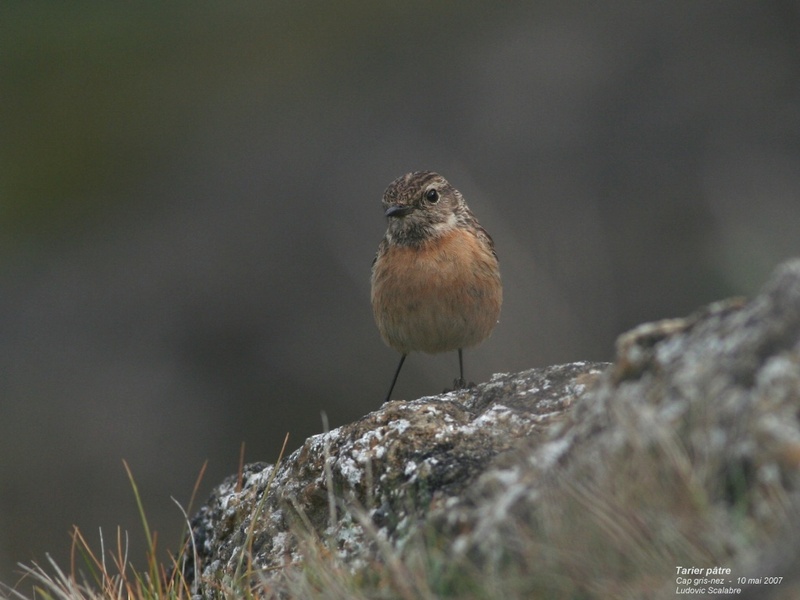 Nothing very extraordinary except that there were no particular influx of other small skuas and particulary Arctics. Also quite unconspicious metorological conditions (gentle breeze from the WSW today and NNW 4 yesterday). 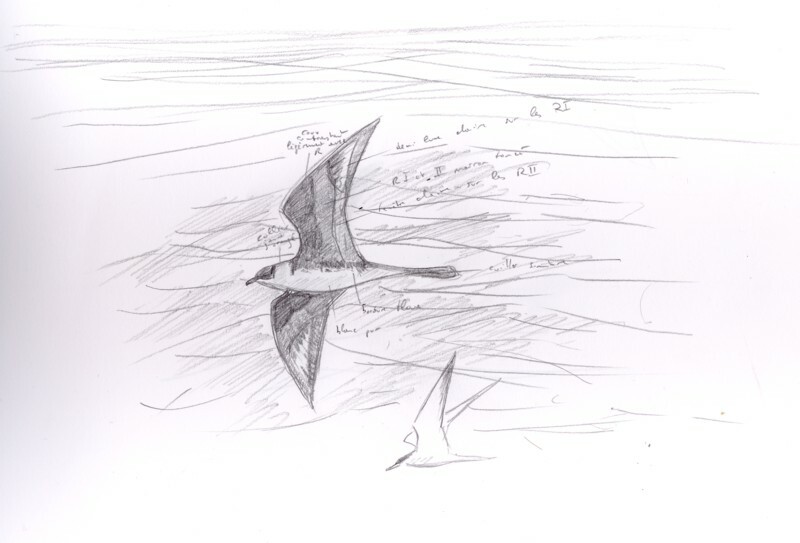 Also there, the proportion of LT Skuas in comparison to Artcic Skua is much higher than usual. Some inIand observation of LT occured in Germany, The Netherlands, Belgium (2) and France (1 in Maine et Loire (49) and 1 in Doubs (25)). Some of them were picked up exhausted and taken in care at revalidation center. Other interesting birds included 2 Red-throated Divers, 1 Red-necked Grebe, 11 Sooty Shearwaters, 2 Balearic Sherawaters, 47 Arctic Skuas, 31 Great Skuas. Some ducks with 2 Wigeons, 11 Teals, 8 Pintails. Poor numbers for terns. Winds continue to be light (except at the end of de day). 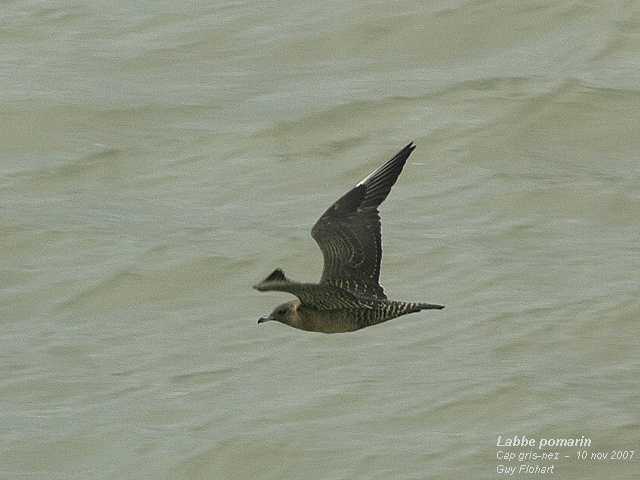 At last, 2 Long-tailed Skuas (juveniles) are seen, with 42 Arctic Skuas and 21 Great Skuas. 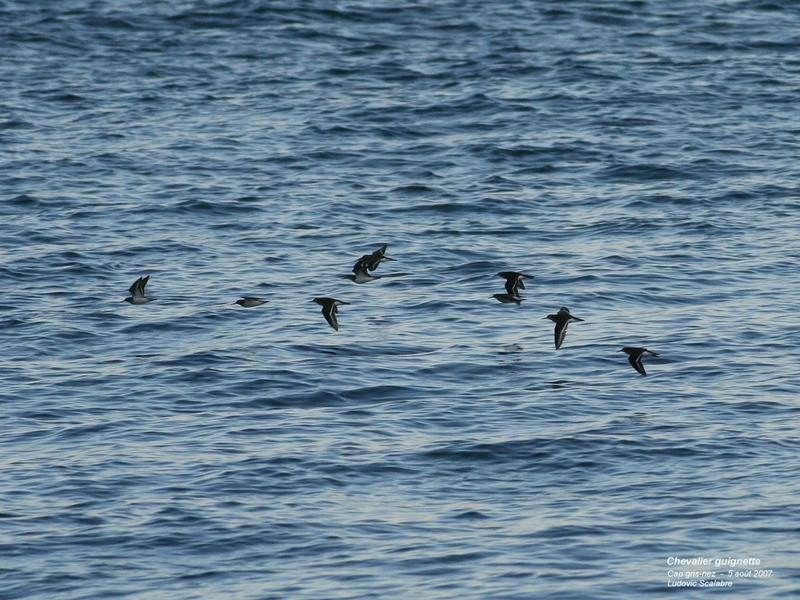 Some Shearwaters : 2 Sooty Shearwaters and 4 Baleric Shearwaters. 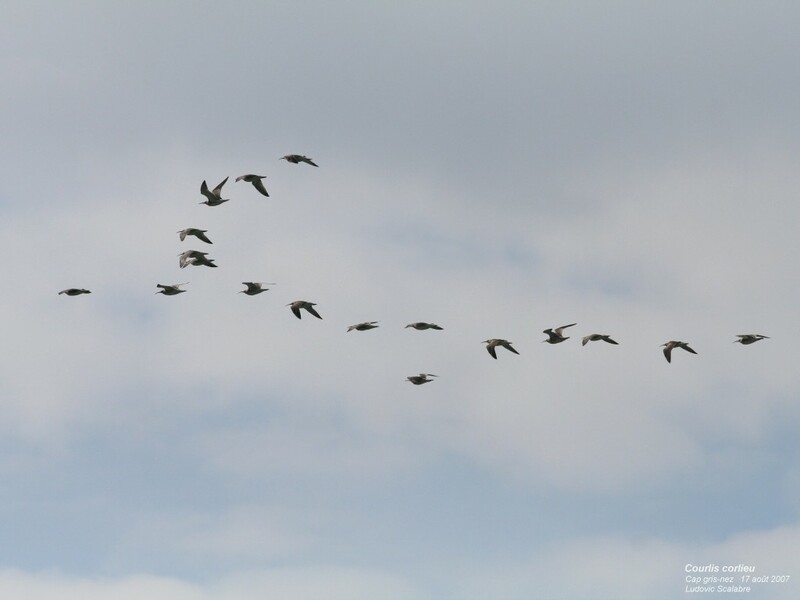 Still few numbers to waders and ducks but 12 Greylag Goose passed over in north flight. Again few terns and gulls with 9 Mediterranean Gulls, 355 Sandwich Terns, 800 Common Terns, 3 Arctic Terns and 7 Little Terns. 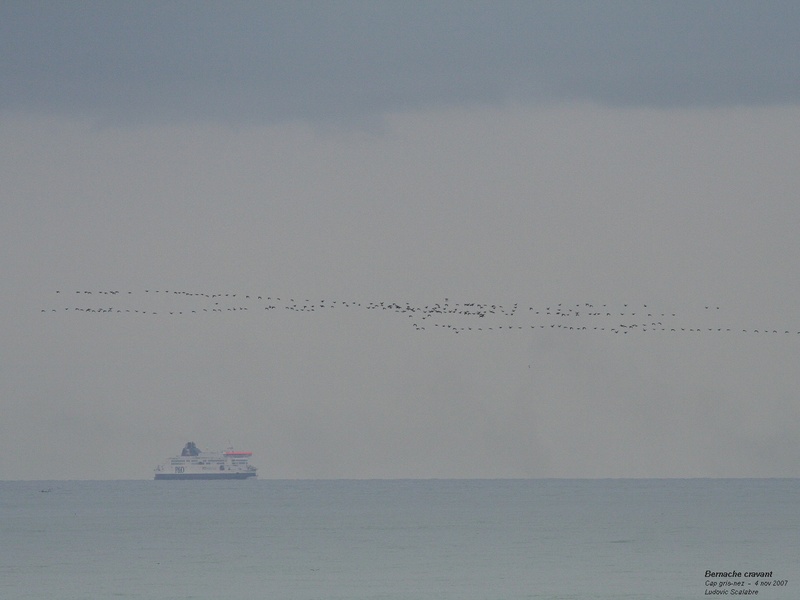 Good local winds and good conditions in north sea produced a good migration today. At the beginning of the day, with NW winds, all the birds mouved at a long range but with SW after midday, birds were closer. Few Shearwaters with 1 Manx Shearwater, 4 Sooty Shearwaters and a goof number of 9 Balearic Shearwaters (already a record for the automn with 80 birds). Few d'anatidés, 228 Common Scoters, and waders. 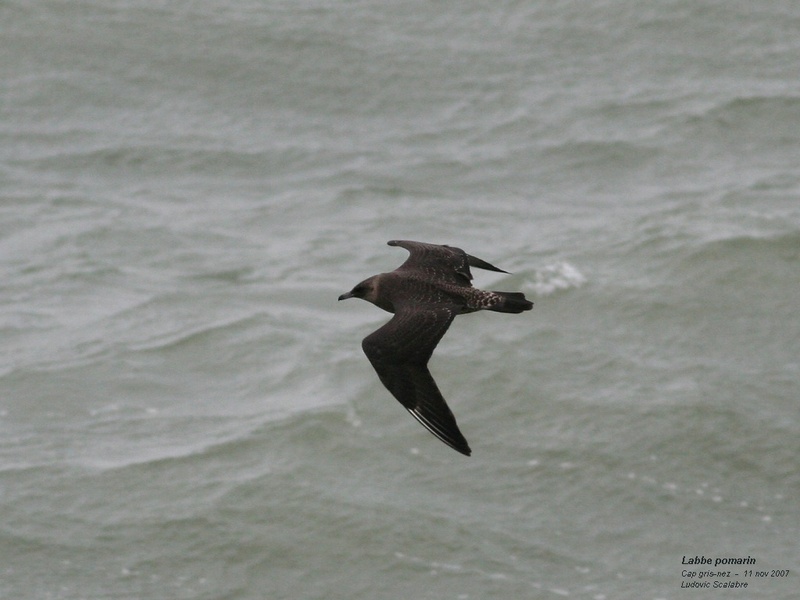 Good migration for skuas with 4 Pomarine Skuas (1ad and 3 immatures 3rd summer), 73 Arctic Skuas (80% dark morph adult, and few immatures), no Long-tailed Skuas despite some observatins in Netherlands, 12 "Little" Skuas species (certainly arctic) and 45 Great Skuas. Few terns.... At least, one leucistic Northern fulmar alarm birders during few seconds !!! 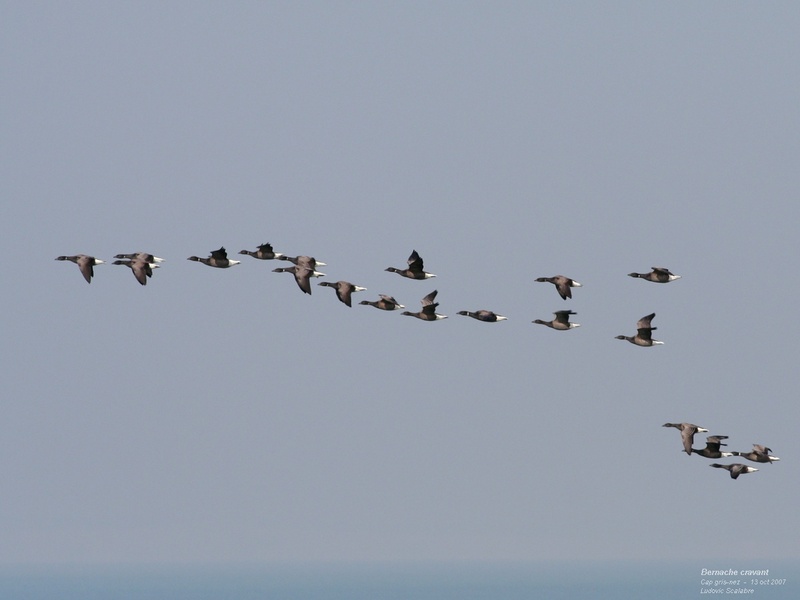 Despite good winds in north sea, no wind at cap gris-nez produced a poor migration. Notable birds are : 1 adult Red-throated Diver (close), 4 Black-necked Grebes. Few ducks with only 29 Common Scoters ! Few waders included 7 Golden Plovers, 11 Knots, 6 Redshanks. Bad numbers for terns with no migration before 3h P.M. 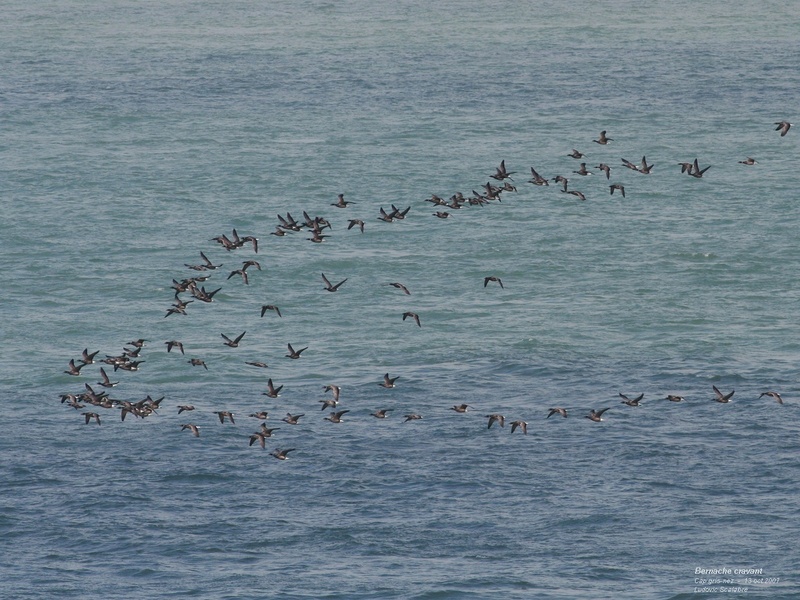 Some Skuas with 18 Arctics Skuas, 2 Greats Skuas, and 4 Skuas species. For the anecdote 4 Black Swans flew over the spot. 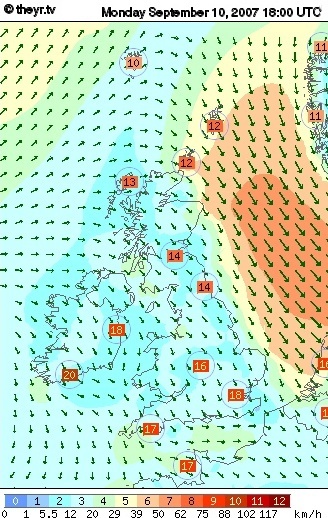 Bad winds for the spot are now well established. Few migration, the only notable birds was 1 Red-necked Grebe, 1 Balearic Shearwater (but fluying north), 7 Garganeys, 1 Pomarine Slua, 1 Arctic Skua, 5 Great Skuas. 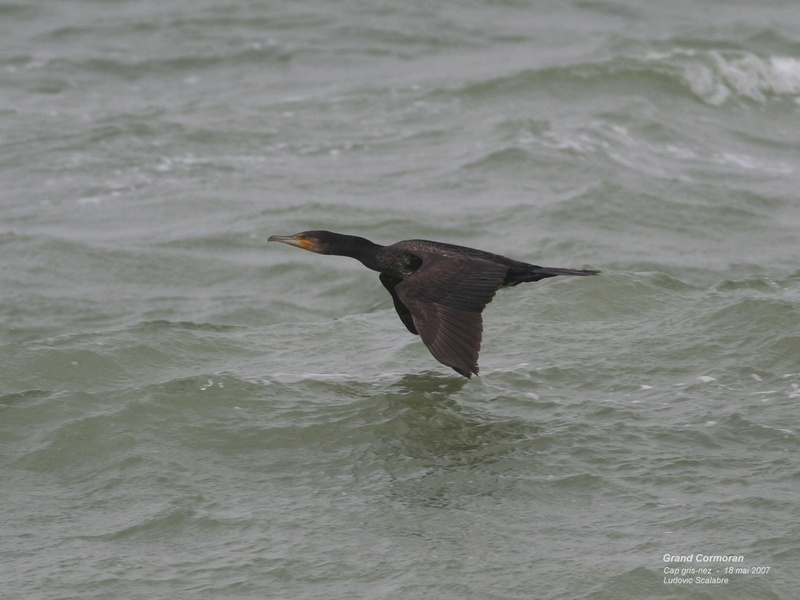 North winds are "limit" conditions to have good birds at Cap gris-nez and this conditions are better for english coast. However, goods birds havec been observed today. 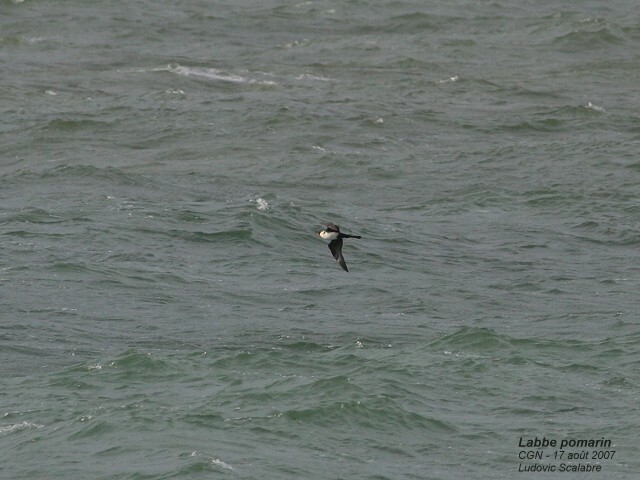 Pelagics concerned 1 Manx Shearwater, the firsts Leach's Petrel and Long-tailed Skua (juv) of the season, 1 Pomarine Skua (adult), 15 Arctic Skuas, 21 Great Skuas and 6 Sk;uas species. Other birds to be seen were 1 Red-necked Grebe, few duck with 4 Wigeons, 14 Teals, 4 Pintails, 1 Tufted Duck, and the first good migration for Common Scoter (858 birds) for 6 weeks. Few waders. Few terns with 182 Sandwich Terns, 386 Common Terns, 12 Little Terns and 22 Black Terns. Rare observation for the spot of a Gull-billed Tern today feeding in front of the cap during 5 minutes. Good migration for waders with 16 species : 22 Oystercatchers, 24 Ringed Plovers, 24 Grey Plovers, 2 Knots, 74 Sanderlings, 1 Little Stint, 21 Dunlins, 48 Snipes (= record of 26/09/1962), 2 Bar-tailes Godwits, 91 Whimbrels, 11 Curlews, 98 Redshanks, 29 Greenshanks (record), 4 Green Sandpipers, 6 Common Sandpipers et 15 Turnstones. Despite bad winds, some pelagics with 1 Sooty Shearwater, 3 Balearic Shearwaters, 4 Arctic Skuas (2 ad dark, 2 ad pale) and 2 Great Skuas. 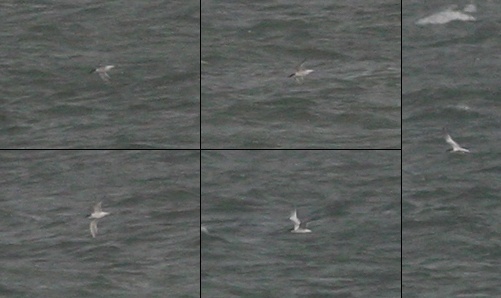 Few Sandwitch Terns (349 ind.) and Common (438 ind.) et 28 Little Terns. Some interesting birds today with 1 Red-necked Grebe, 2 Balearic Shearwaters, 1 Pomarine Skua, 3 Arctic Skuas and 3 Great Skuas. Few ducks with, 49 Shelducks and 121 Common Scoters. Few waders with 2 Curlew Sandpipers (uncommon), 30 Bar-tailed Godwits, 103 Whimbrels, 6 Redshanks and 8 Greenshanks (uncommon in seawatching). Classic numbers for Sandwitch Terns (380 ind.) and Common Terns (1553 ind. ), a good number with 149 Little Terns, and 4 Black Terns. Good winds produced good numbers and species today. New record for Balearic Sherawaters (18 birds) (Old record was 13 birds in august 1983), and 5 shearwaters species (could be Balearic/Manx). Other Pelagics were 4 Sooty Shearwaters, 2 Manx Shearwaters, 6 Pomarine Skuas (adults with 2 close birds), 17 Arctic Skuas and 2 Great Skuas and a close adult Sabine's Gull. Few ducks 2 Shelducks, 3 Pintail, 1 Garganey, 2 Shovelers and 187 Common Scoters, some waders, 19 Oystercatchers, 19 Ringed Plovers, 13 Grey Plovers, 1 Sanderling, 5 Dunlins, 25 Bar-tailed Godwit, 83 Whimbrels and 6 Turnstones. The passage of terns conform for the period with 764 Sandwich Terns, 1 964 Common Terns, 4 Arctic Terns, 31 Little Terns and 3 Black Terns. 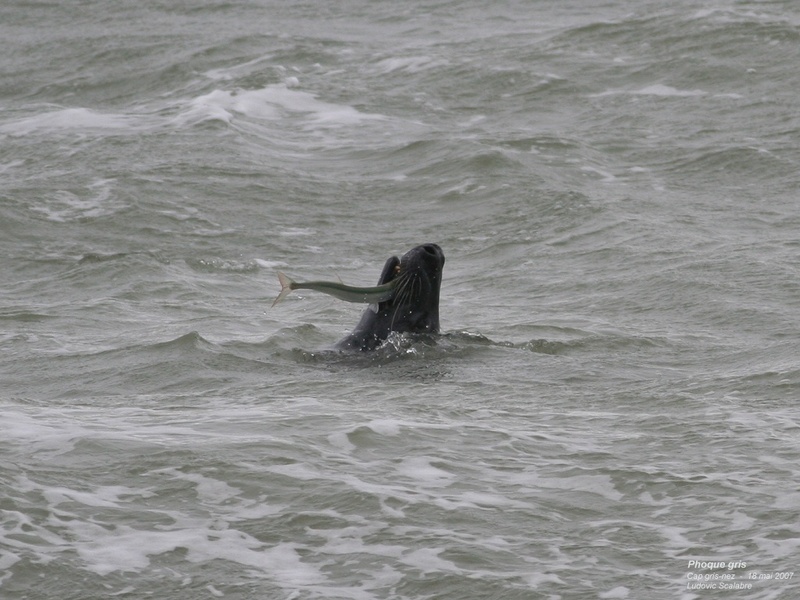 Good winds on the spot and north sea produced some pelagics. We note 11 Fulmars, 3 Sooty Shearwaters, 5 Manx Shearwaters, and 11 Puffins des Baléares (record is 13), with a group of 3 notice earlier at le clipon, 21 Arctic Skuas, 6 Great Skuas and 3 Skuas species. Few ducks and waders just in interest 52 Whimbrels. The terns passage is still so poor with 154 Sandwich Terns, 743 Common Terns and 2 Black Tern. Nothing to report except 2 Balearic Shearwaters, 4 Little Terns and 5 Black Terns. No migration today, just in interest 2 Red-necked Grebes and 2 Black-necked Grebes, some waders and ducks (just units) and no passage for terns. At last ! some wind with a better movement today ! 5 Great Crested Grebes and 1 Red-necked Grebe. Some shearwaters with 2 Sooty Shearwaters and 5 Balearic Shearwaders (already 30 Birds this year). Better passage for waders, 19 Oystercatchers, 3 Ringed Plovers, 1 Grey Plover, 22 Knots, 10 Sanderlings, 2 Dunlins, 43 Bar-tailed Godwits, 2 Common Sandpipers and an other good numbers for Whimbrels (103 ind.). 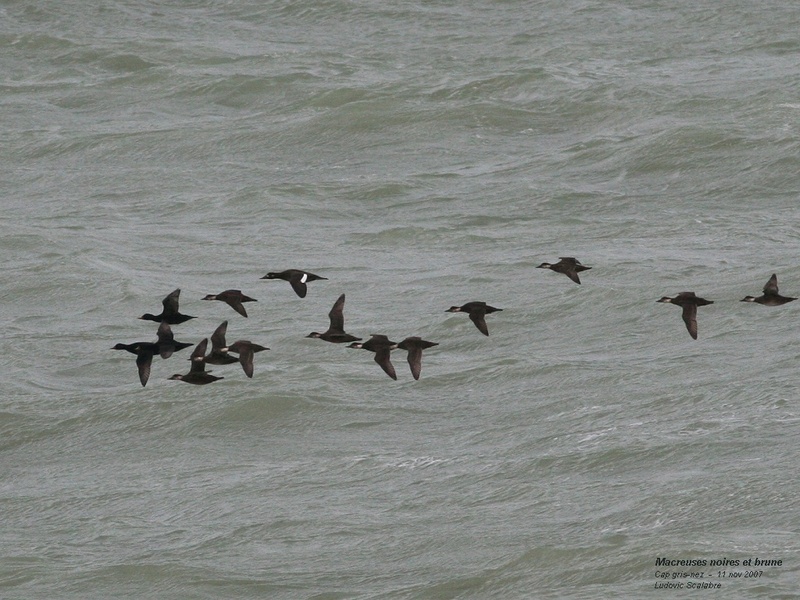 Some skuas with 5 Arctic Skuas, 1 POmarin and 7 Great Skuas. 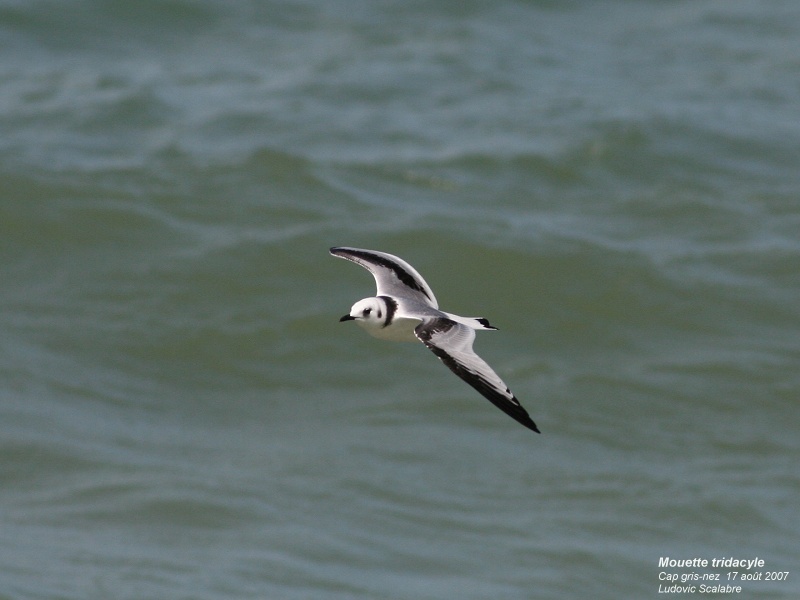 Migration continue to be very quiet for terns, only 113 Sandwitch Terns and 554 Common Terns, other birds are 22 Mediterranean Gulls, 11 Little Gulls, 3 Arctic Terns, 5 Little Terns and 42 Blacl Terns. Very quiet today. Birds in interest are 2 Balearic Shearwaters (flighing north), 1 Marsh harrier, 1 Hen Harriers (juv crossing channel from england), 12 Redshank, 1 Arctic Skua, 5 Great Skuas and 5 Skuas species. Few terns in movement good birds are 20 Black Terns and a juvenile Arctic Tern. Some good birds with NW winds. 1 Balearic Shearwaters and 1 Sooty Shearwater. Few ducks and waders, best species are 336 Common Scoters, 7 Grey Plovers, 11 Dunlins and 4 Whimbrels. 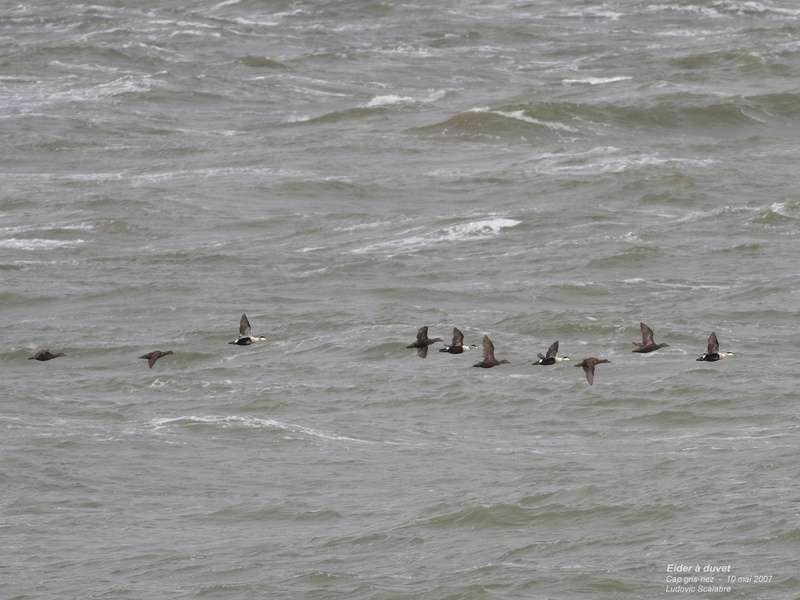 Some skuas with 6 Arctic Skuas, 1 Great Skua and 3 Skuas species. Good movement for terns with 657 Sandwich Terns, 1574 Common Terns, 1 Little Tern and 27 Black Terns. Few birds with bad winds. Only interesting to report ; 1 Shag, 1 Tufted Duck, 2 Arctic Skuas, 1 Little Gull, 201 Sandwich Terns, 550 Common Terns and 1 Black Tern. Few birds with some good waders for the spot. Seabirds seen today are , 2 balearics Shearwaters and 3 Arctic Skuas. Good waders for the cap are 7 Snipe, 1 Greenshank and 4 Green Sandpipers (less than annual at the cap). Others waders more usual with 49 Oystercatchers, 22 Knots, 1 Bécasseau sanderling, 67 Whimbrels, 4 Curlews and 10 Common Sandpipers. Lots of Black-headed gulls with 1540 ind. Few terns, 156 Sandwich Terns, 535 Common Terns, 13 Little Terns and 4 Black Terns. Some passerines with 61 Swifts, 4 Sand Martins, 122 Swallows, 8 House Martins and a new Short-toed Tree creeper in the cliff. 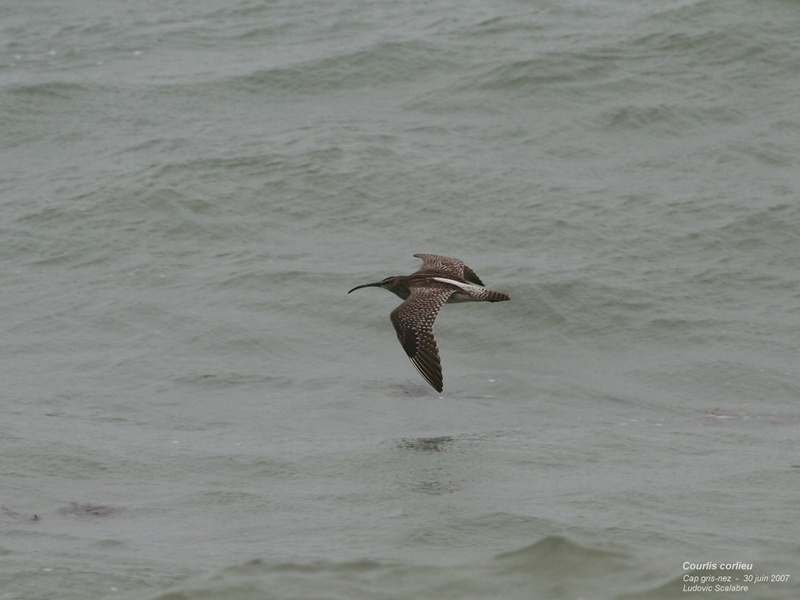 Few birds but some good species with a very "early" Sooty Shearwater (just one previous record in july 07/07/2005) and 10 Manx Shearwaters (with 2 flocks of 3 birds) all of them very far at sea. 13 Grey Herons, 1 Mallard and 312 Common Scoters seen flying South. Few waders with 57 Oystercatchers, 4 Whimbrels and 5 Curlews. 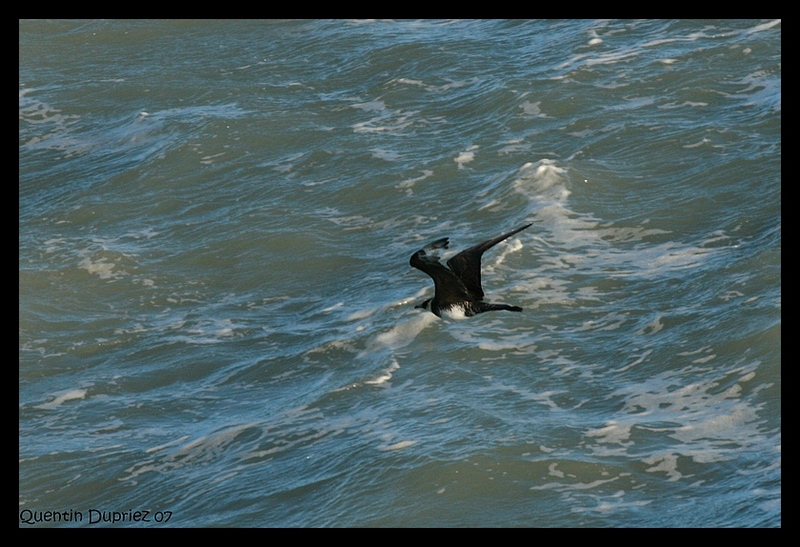 An other Arctic Skua (Dark adult) seen and 1 Great Skua. Decrease of numbers for Sandwitch Terns (235 birds) juveniles still very numerous, and 18 Common Terns and 18 Mediterranean Gulls. 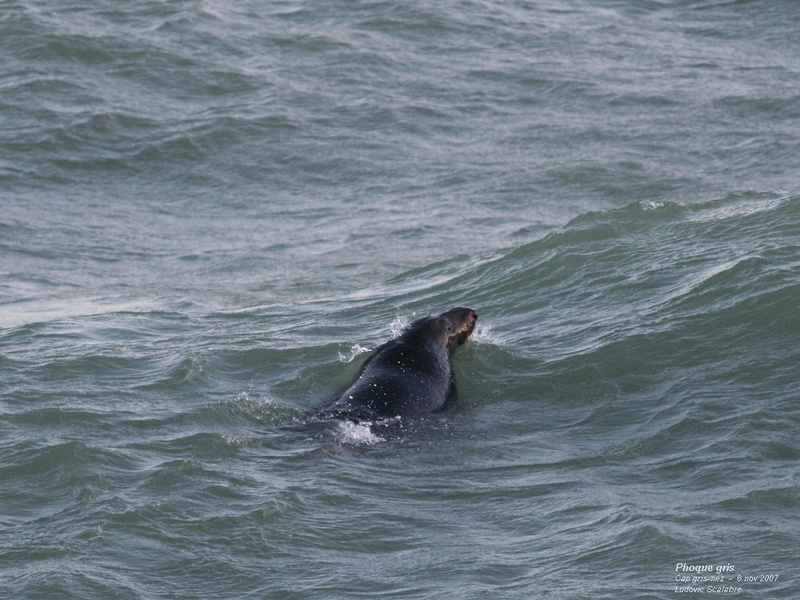 1 Grey Seal at sea. Little passage for Great-crested Grebe (7 birds) and the 1st Red-necked Grebe of the season (normal date). No wind but again 5 Manx Shearwaters and 1 Balearic Shearwater. 4 Little Egrets and 3 Grey Heron are seen. 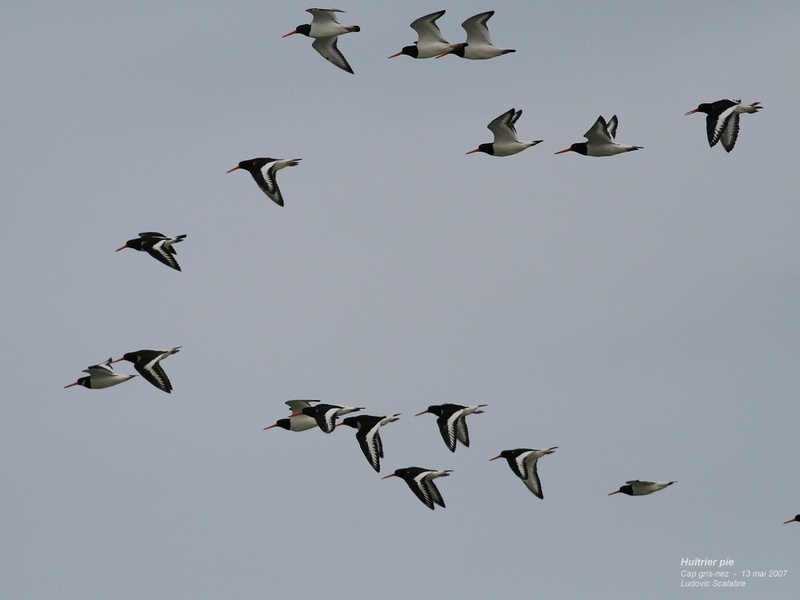 1st movement of 31 Shelducks flying north (moulting in wadden sea), other ducks are 5 Gadwalls and 450 Common Scoters. Some Waders with 78 Oystercatchers, 4 Ringed Plovers, 35 Whimbrels, and 8 Curlews. 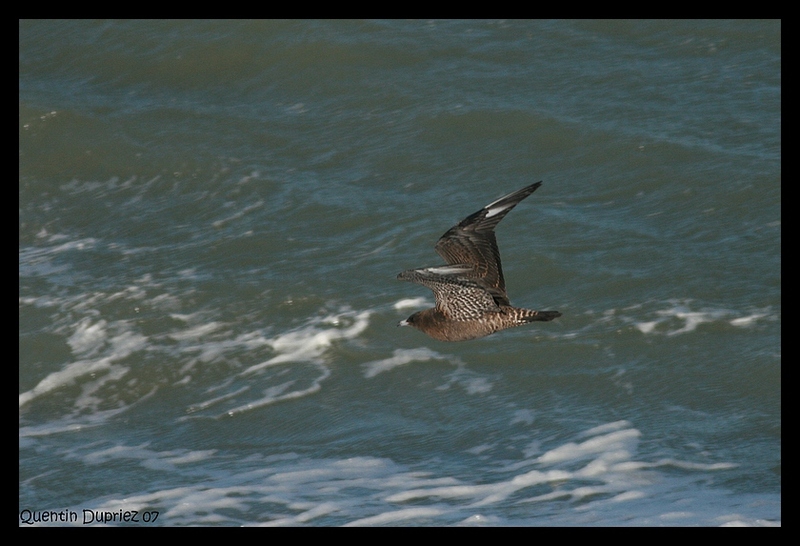 The Great Skua (5 birds) continue to be seen every day and a new Arctic skua (adult) is seen flying south. The 5 first Little Gulls of the season are seen. We note a very important and early movement of Sandwich tern with 682 birds with 25% juveniles, and some Common Terns (31 birds). 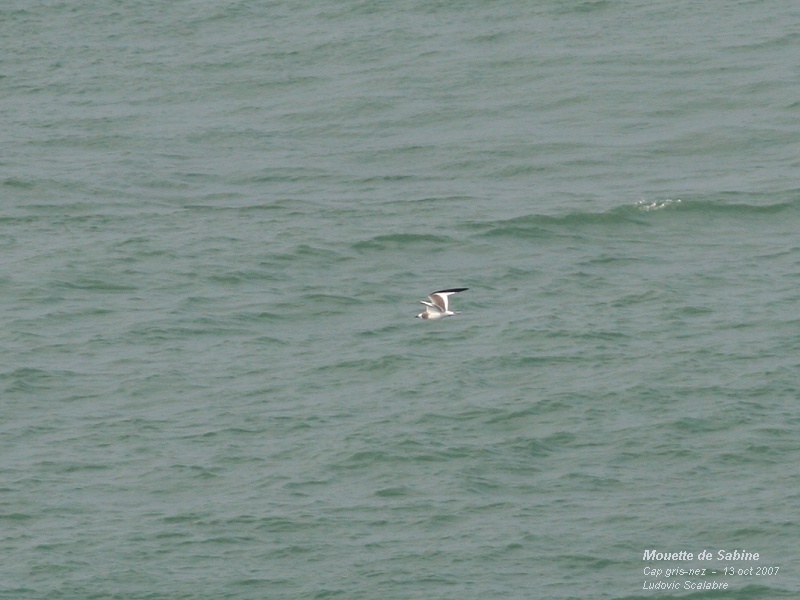 2 Guillemots and a very early Razorbill (only one previous record for july) are seen. Good surprise for the spot with a Short-toed Tree Creeper (juvenile) in the rocks. Strong SW the day before and night produced a good seance with birds flying north at the beginning and south when winds decreasewith 50 Manx Shearwaters (27 north, 23 south) 1 Balearic Shearwater, and 3 Storm Petrels (1st record for a july month). 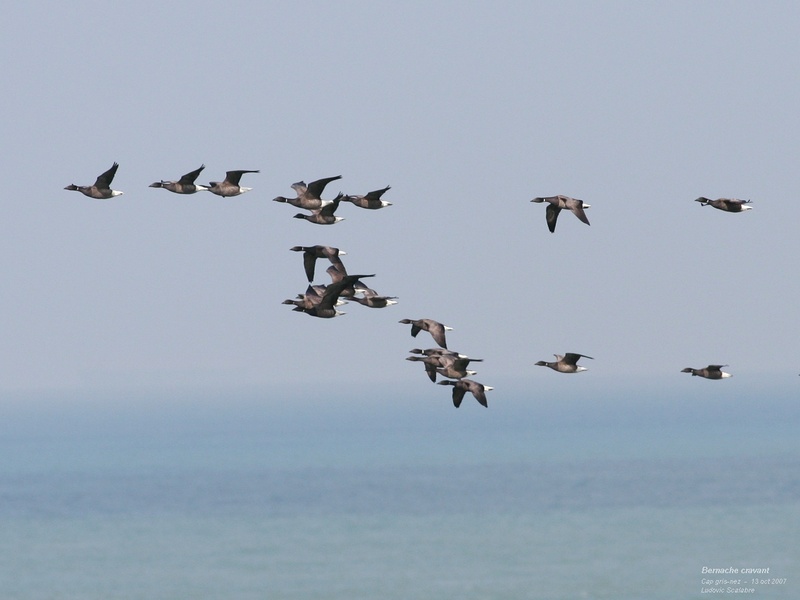 First good movement for Common Scoters with 686 Birds. Few waders with 13 Oystercatchers, 1 Red Knot (in a group of Black Scoters) and 13 Curlews. 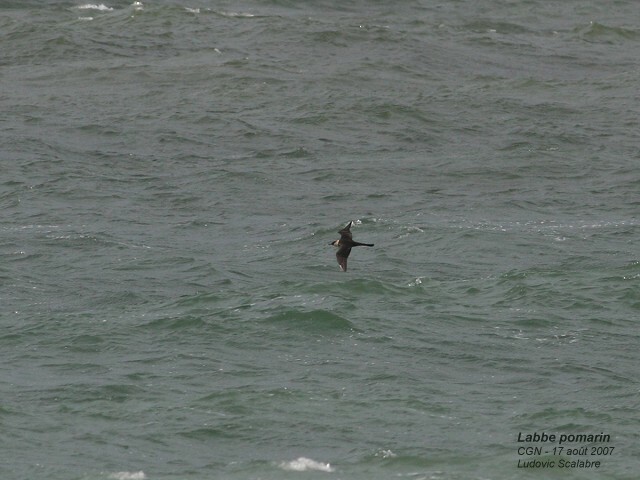 Again 4 Great Skuas and 1 Arctic Skua (uncommun at the beginning of july). Little movement for Sandwich Tern (187 Birds), and 2 Common Terns. Very good day for the period !! Again 15 Manx Shearwaters flying south with 2 Balearics Shearwaters (2nd for a month of june) with one dark morph and one pale morph. 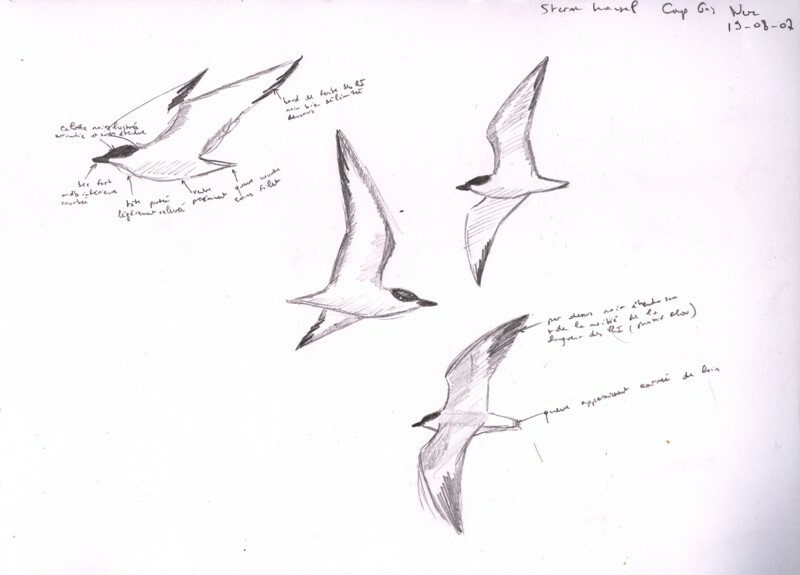 We notice our 1st Storm Petrel for a month of june a bird feeding and going away to the north. Other birds include 93 Common Scoters, 11 Oystercatchers, 2 Whimbrels, 17 Curlew. 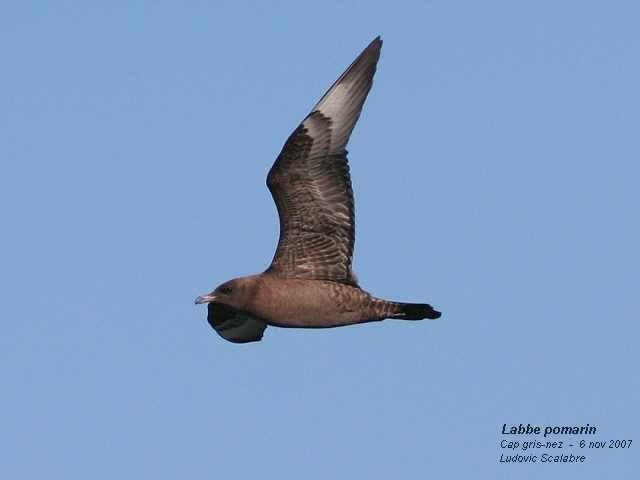 We note 5 Greats Skuas, the specie is very common this year, and it is unusual for june. Some movements of Black-Headed Gulls (217 birds), 10 Mediterranean Gulls, 147 Sandwich Terns with already 4 juveniles 1 Common Tern and 3 Little Terns. Very good movement of Manx Shearwater with 56 birds in 1 hour seawatching. Amazing observations and weather conditions for june !! Very quiet todauy with 1 Manx Shearwater flying South, 262 Gannets flying north (10% adults), 53 Common Scoters, 1 Whimbrel, 3 Curlews, 3 Great Skuas (staying), 4 Mediterranean Gulls (immatures), 5 Common Terns flying north, 1 Guillemot. 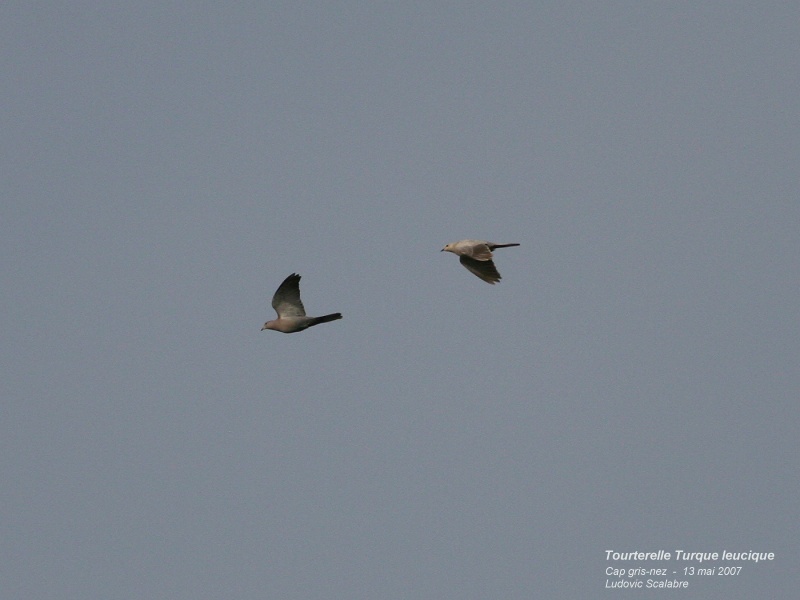 1st record in June for Balearic Sheawater with 3 birds (1 fly south early in the morning, 2 other flying north later). Some Gannets (168 ind.) flying north. Few ducks with 11 Shelducks flying south, 4 Gadwalls, 5 Teals (Ad male) and 18 Common Scoters. 1 Great Skua flying north and a little movement of 96 Black-headed Gulls 1st summer. 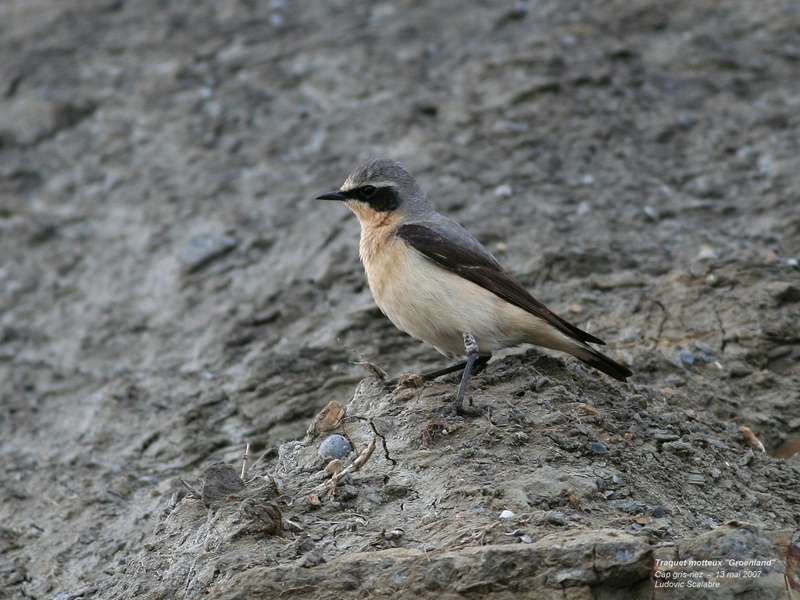 We notice also 6 Sands Martins, 5 Barn Swallows, and 21 House Martins crossing the channel. Few birds today with avec 2 Red-throated Divers, 2 Great-crested Grebes, 200 Gannets, 5 Mute Swans, 2 Canada Goose, 220 Common Scoters, few waders, 1 Arctic Skua, 1 Great Skua, 14 Little Terns and no passerines. The end of season seems to come with 1 or 2 weeks (for terns) before the 2 previous years. 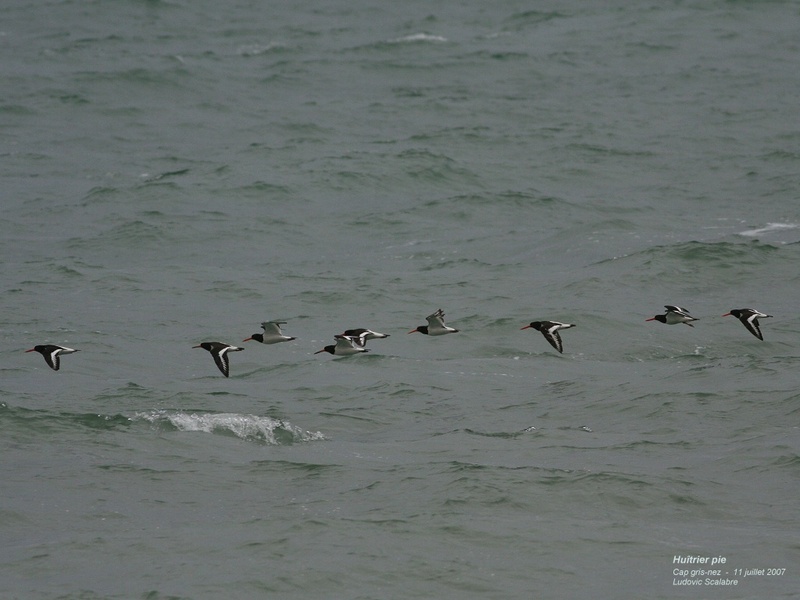 Few seabirds with 2 Red-throated Divers and 8 Great-crested Grebes. 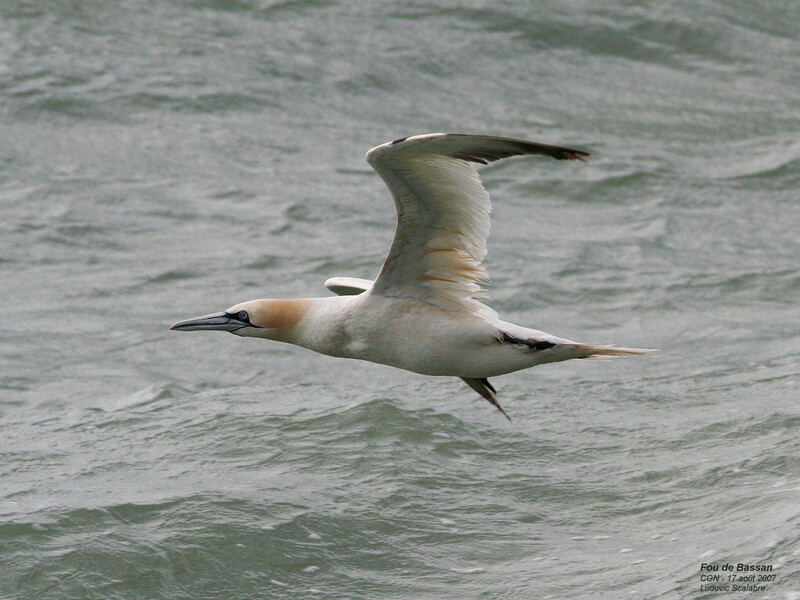 Good numbers for Gannet (1 104 ind.) and Common Scoters with 512 birds. Some raptors with 1 Marsh Harrier and 1 Sparrowhawk. Few waders, we note light migration of Sanderlings (48 ind.). 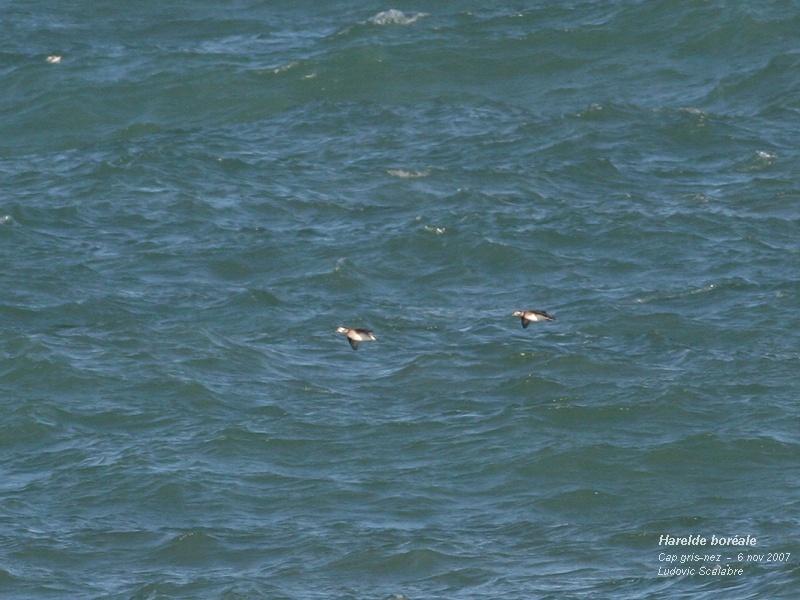 Few skuas but 2 Pomarines Skuas together (7th and 8th of the year) are seen, and 1 Great Skua. 6 Little Terns, but no White-winged black Terns, the important influx of birds of Nederlands and Belgium did not produce birds for the Cap. 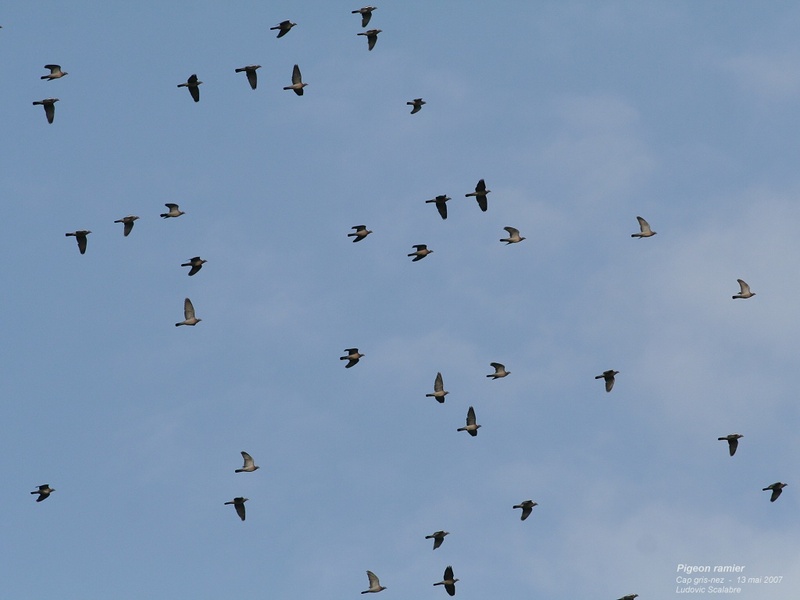 Good migration for passerines with 124 Wood Pigeons, 251 Swifts, 4 Sand Martins, 366 Barn Swallows, 382 House Martins. The end of the season is approching... and bad winds produce low numbers. 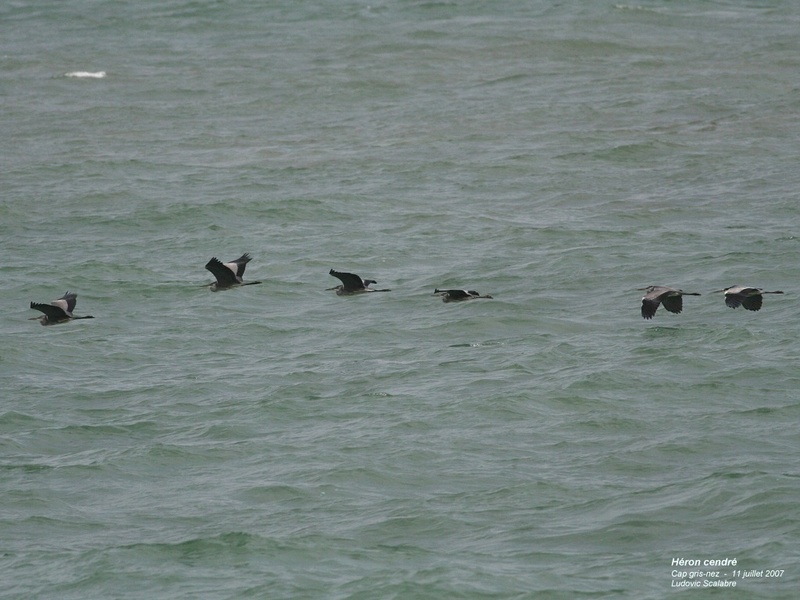 Some divers with 2 Red-throated Divers and 4 Black-throated Divers, 2 Manx Shearwaters. Few ducks and waders. "Good" migration for raptors with 3 Marsh Harriers, 4 Sparrowhawk, 1 Kestrel et 1 Hobby. 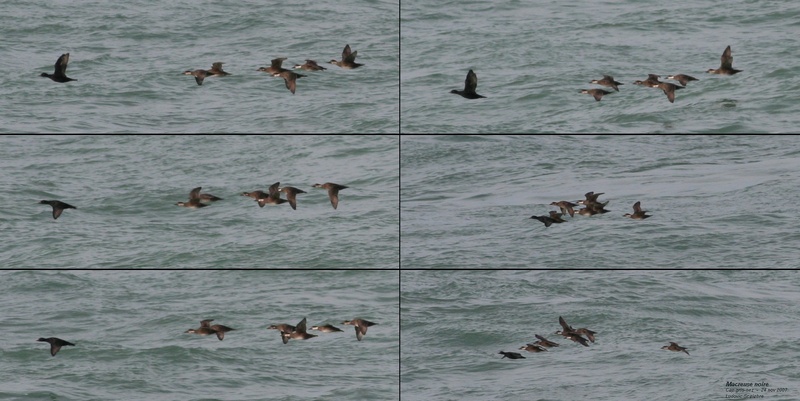 Some skuas with 9 Arctic Skuas and 2 Great Skuas. Few terns. Good numbers for some passerines with 117 Wood Pigeons, 11 Swifts, 27 Sand Martins, 1146 Barn Swallows, 206 House Martins and 47 Yellow Wagtails. Very bad weather...... and few birds. Only 2 Black-throated Divers and 1 Diver species seen. 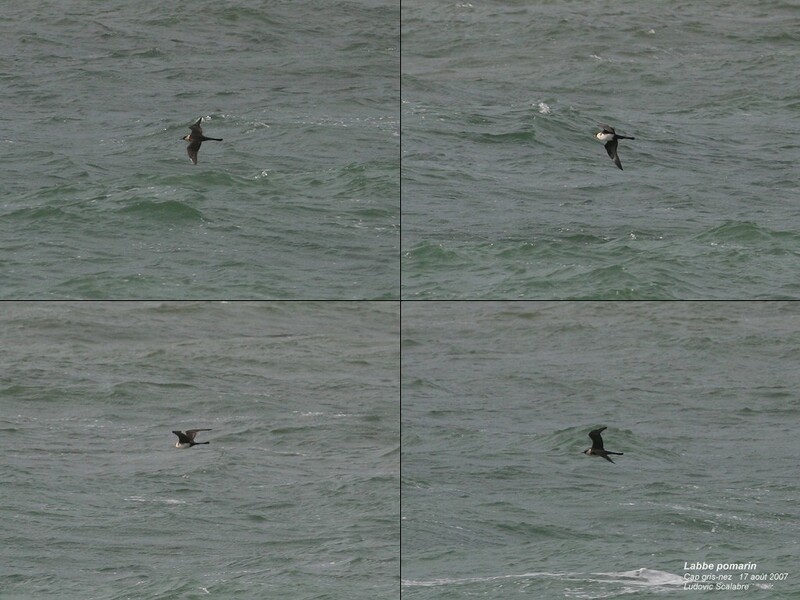 Strong SW winds produced 4 Manx Shearwaters. Very little numbers of ducks and waders. 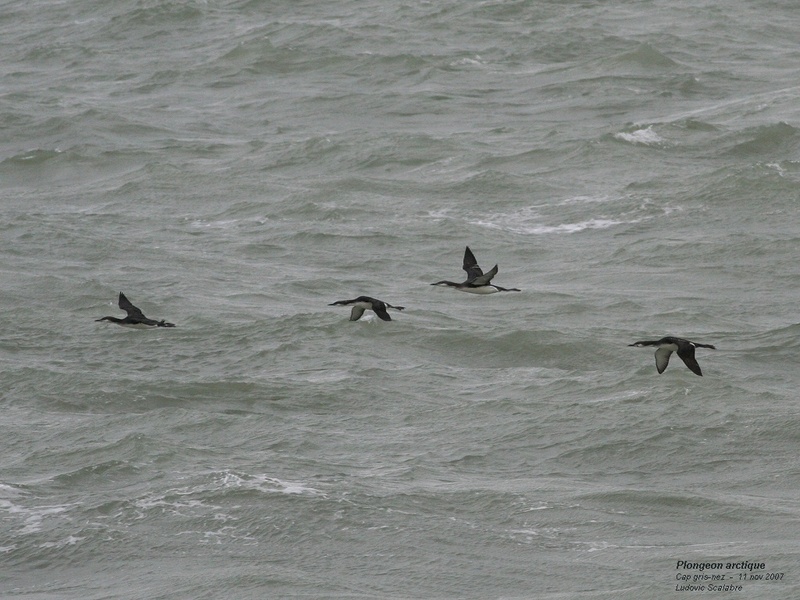 Some sluas with 5 arctic Skuas adults dark morph and 3 Skuas species. Few terns and , guifettes and guillemots or razorbill, and some passerines with 240 Barn Swallows and 78 House Martins. 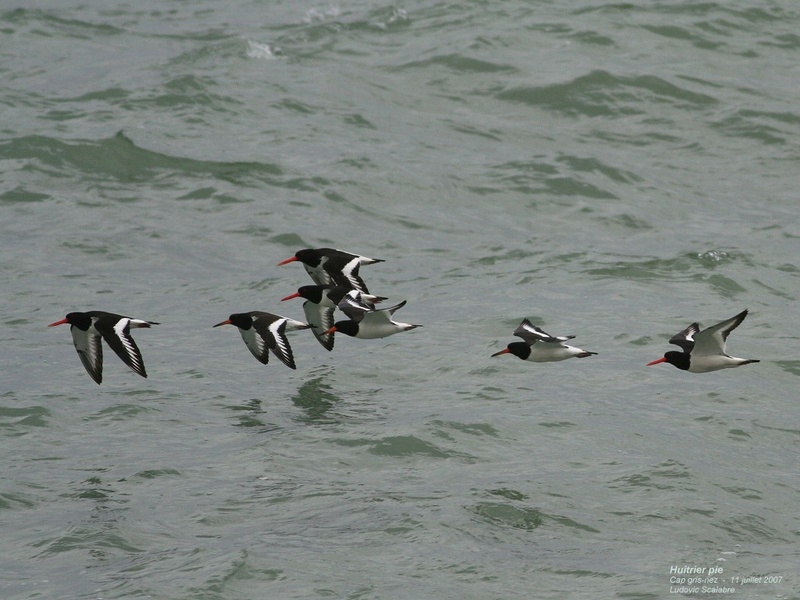 Very poor migration for seabirds ! For the first time, no divers and skuas. Few ducks with 13 Shelducks, 3 Eiders and 619 Common Scoters. One Marsh Harrier and 1 Hobby are seen. Few waders except 43 Oystercatchers and few terns. Good migration for passerines with 12 Stock Doves, 980 Wood Pigeons, 16 Collared Doves with a leucistic bird, 2 Turtle Dovs, 55 Swifts, 23 Sand Martins, 355 Swallows, 55 House Martins, 3 Tree Pipits, 55 Yellow Wagtails, 1 Groënland Wheatear, 3 Tree Sparrows, 17 Goldfinchs, 4 Siskins and 14 Linnets. 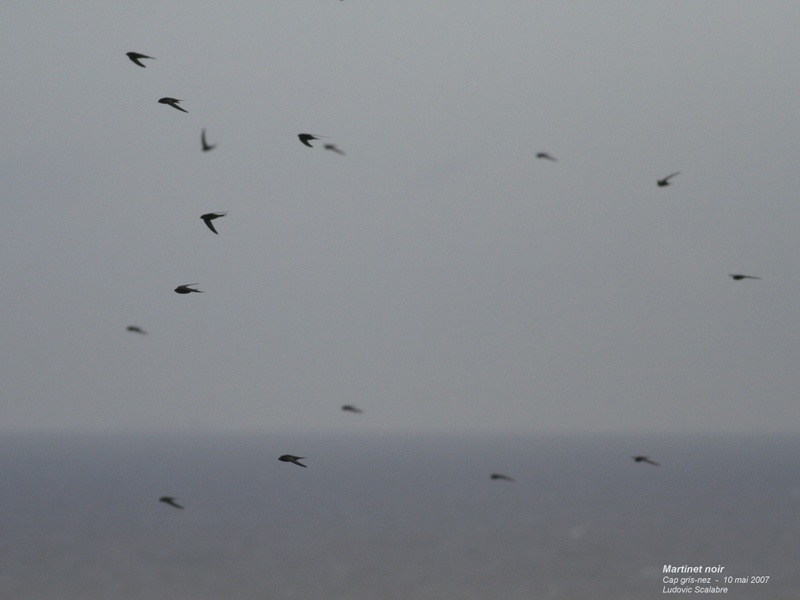 Amazing movement of Swift with 7 370 Birds in migration to UK !!! 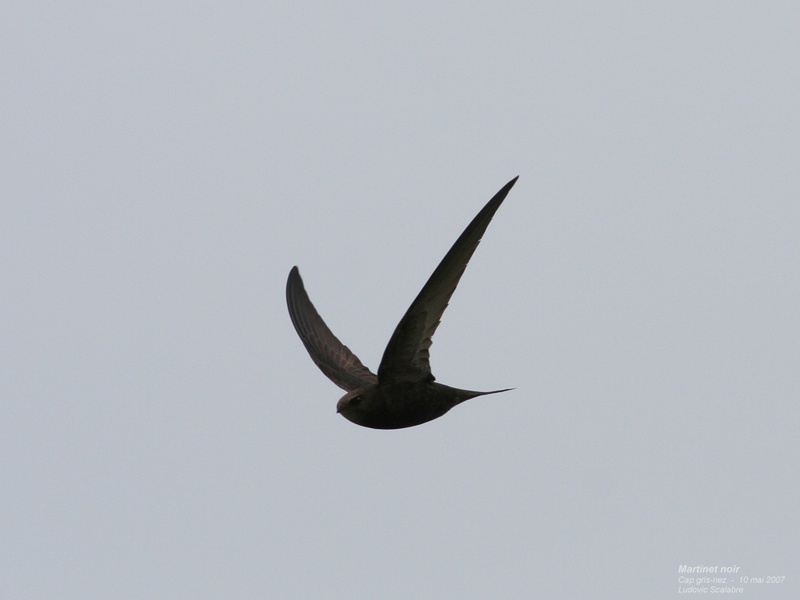 Big migration of Common Swift !!!!!! 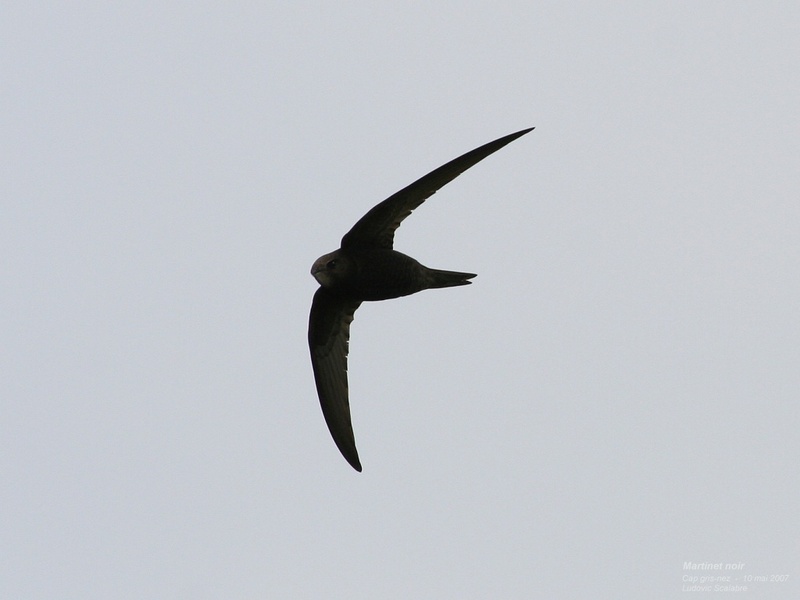 The amazing movement of Swift begins at the end of the showers at the begining of the day. 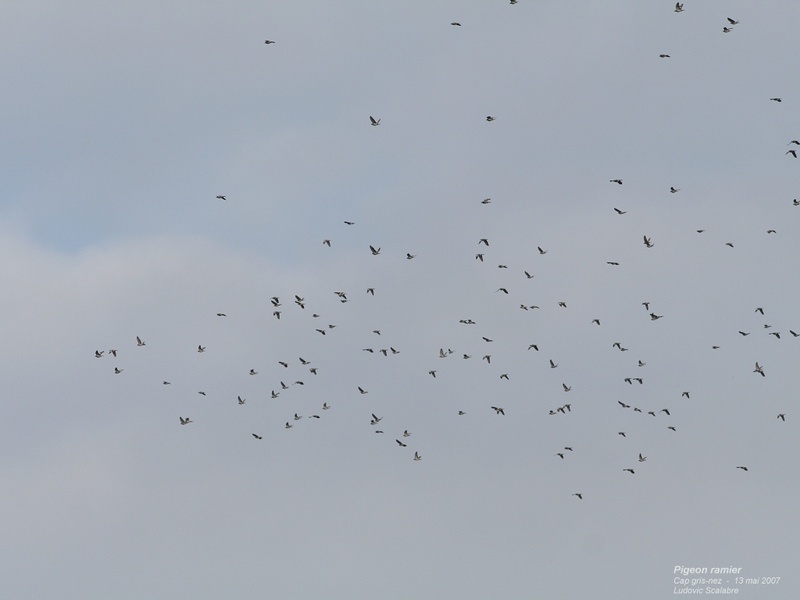 Thousand of birds from inland stand few minutes at the Cap and begins to fly over sea to UK. Just 2 birders cont 7 370 birds (best ever of the spot) but probably 10 000+ flew over the Cap just in the morning. When we left at 1 P.M. the movement was not finish !! 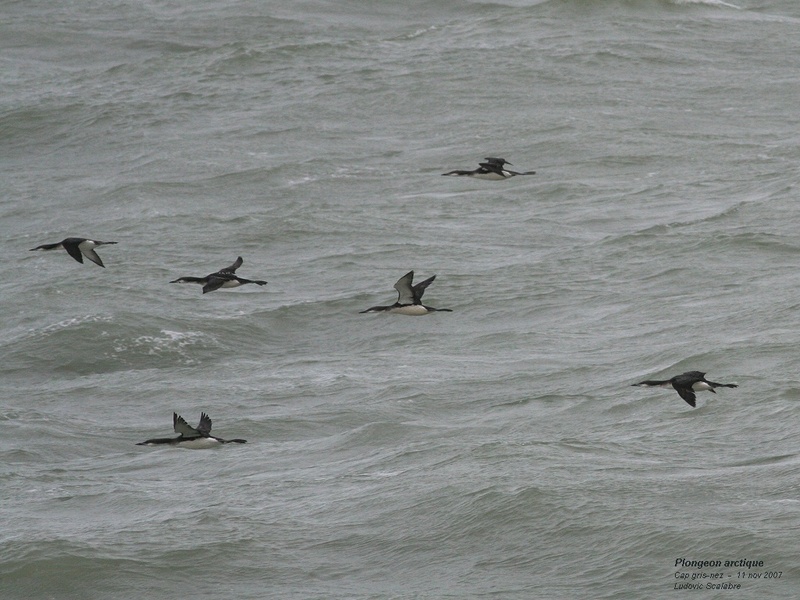 Few seabirds today with 9 Red-throated Divers, 16 Black-throated Divers, 1 Great northern Diver (6th of the spring !!) few Great crested Grebes (8 birds) and 1 Red-necked Grebe. 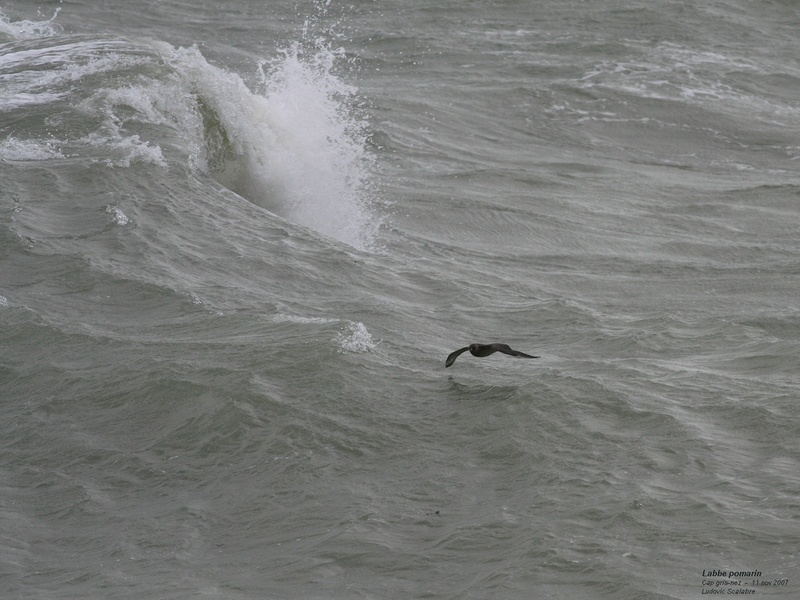 Again 2 Manx Shearwaters with this strong SW wind. Few ducks except 650 Common Scoter. 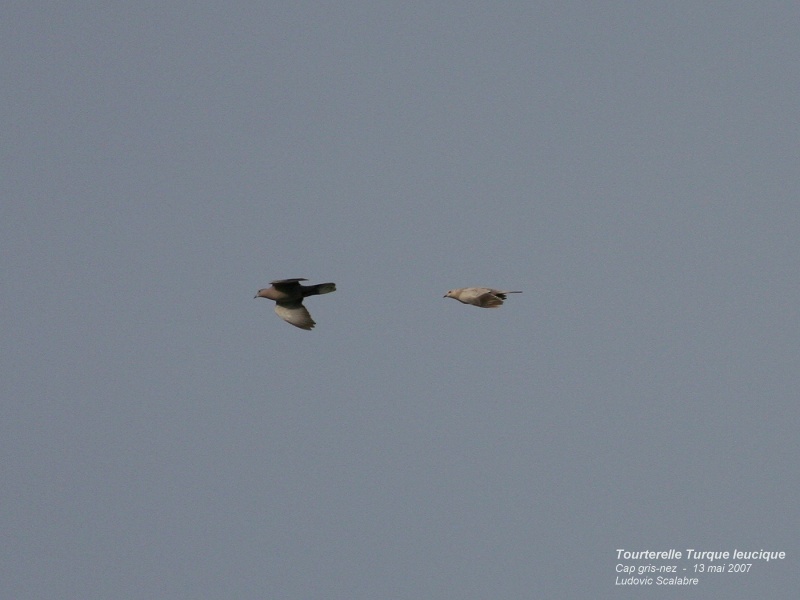 A Falco species seen too late should have been a Red-footed Falcon but it is not possible to confirm this short observation. Few waders with 46 Whimbrel, 5 Common Sandpipers. Few skuas with 11 Arctic Skuas, and 1 Great Skua. Few terns. Not a lot of passerines except swifts, 2 Sand Martins, 177 Swallows and 27 House Martins.